Disclaimer: The characters you recognize were created by Chris Carter. The rest are mine. Mine! Summary: Set eleven months after Christmas in (Haven) Maine, Mulder and Scully moved their family to Ballyguest, a small community in New England. To their dismay it soon becomes clear that Ballyguest isn't the sleepy little town they were hoping for. Their first clue? A local inn with a strange reputation. Bright late autumn sunlight streamed in through the windows, making the kitchen seem even emptier than it currently was. At the moment, the only things in the kitchen were me and a stack of boxes. I was in the middle lifting the flaps to one of the boxes when a gruff voice asked me where I wanted the hutch put. I pointed to the far wall of the kitchen. "There would be great, thank you." The men moving the awkward piece of furniture seemed too out of breath to use actual words to acknowledge what I said, and I reminded myself to look in the refrigerator to see if the sodas we had put in their earlier in the day were cold yet. Both men looked like they could use a nice cool drink after moving that monstrosity. If it wouldn't have broken my mother's heart, I would have left the hutch behind; it had belonged to some female relative far back in the Scully line, and somehow I was stuck with the damn thing. Mulder walked into the room, and paused to look at me. "Are you sure you want to do all the kitchen unpacking yourself?" "I'm sure." I flicked a flap of the box with one finger. "Call it putting my nesting instinct to good use," I suggested. "And it's not as though we're going to have a lot of time to unpack when the baby gets here." He looked down at my belly. My doctor said that we had a few weeks before the baby arrived, but I felt that she and I were both getting impatient at that point. "Promise you won't over do it, then," Mulder said, trying to adopt a stern tone. He failed miserably because the good humor never left his eyes. "I promise," I said, smiling up at him. When the baby kicked, I let my hand skim over my belly. It had been over ten months since we'd gotten home from our nightmarish Christmas vacation, but what we'd found on our doorstep that night made this baby possible: a container of my stolen ova carefully preserved in liquid nitrogen. Once we'd had the ova examined to determine their viability, it hadn't taken Mulder and I very long to decide that we'd been given a gift that ought to be used. One time when I found myself fretting about whether or not another baby at our age was wise considering all the risks associated with late motherhood, Mulder had started laughing. Even though I glared at him, he hadn't stopped. Eventually I got him to tell me what was so funny, and he pointed out that the ova were from when I was more than a decade younger, so the increased risks would mostly be to my health. When I related this to my OB, he smiled and told me that Mulder was right. If I'd been a woman seeking to get pregnant with donor eggs, he'd have no problem helping me since I was in good shape, and this way I'd basically be my own donor. I got pregnant on the first try, and here we were, anxiously waiting to meet the little girl who would complete our family. I don't know who was more excited about the baby, me and Mulder, or William and Joey. They'd gotten even more excited when they found out that the baby was a girl, which Mulder found funny. I didn't, though. I could understand the appeal of wanting a brother and a sister. I just hoped that the baby wouldn't, since we weren't up to adding another girl to the family later. If I hadn't gotten pregnant, we probably would have moved in June like we'd originally planned before we made our December 26th doorstep discovery, but preparing for a baby has a way of disrupting one's plans. Plan B, to move before the school year started, also fell through because of delays with closing on the house, so here we were moving just days before Thanksgiving. Thank God we'd be driving to Bill and Tara's for the holiday, because it seemed impossible to believe I could manage to both unpack and cook an elaborate dinner. We'd have Christmas here, partly to spare us traveling with a newborn, and partly because our taking a turn as hosts was coming due. "Your mom took the boys to the park. Do you mind if I go out for a little while?" Mulder asked, touching my arm to break me of wool-gathering. That explained why the house was so quiet. Mom had come up more to help keep the boys occupied and to see the sights than to help unpack. "Go ahead," I said. "Where are you going anyway?" "Staples. I thought I'd stock up on office supplies for my office." Mulder's office. Now there was something that might not have been the best solution... Considering my success with treating Sandhoff Disease, I'd been courted by a new state-of-the-art medical research facility nearby and would be taking a position there when the baby was three months old, but Mulder wasn't going to get a new job. "Scully?" I realized that I'd been spacing out again, and shook my head before smiling at him. "Do you need anything? There's a grocery store right next to Staples." I listened for a moment, and thought about the men dragging in furniture. "Really cold soda. In cans," I suggested, waving my hands towards the sound of something very large going into the living room. "They've been working hard." "Sure. I'll ask them what kind they want on my way out." "Great. Oh, could you pick up some ziplock bags and bowls with covers? We should bring them with us to Bill so they don't have to give us theirs, since you know we won't escape without leftovers," I said, going back to sorting through the box of kitchen tools. Though I wouldn't admit it, I was a little jealous. He already knew where to go shopping, but I hadn't really had time to explore our new town yet. As if to remind me why, the baby gave me a vicious kick. I knew, I thought as I rubbed my belly, there would be plenty of time to explore later. It was just that though I'd insisted that I'd wanted to unpack the kitchen alone, I hated to be cooped up doing it. Eventually I got bored of opening boxes and went outside when I heard my sons' voices. Mom must have come back with them. "Boys, come over here out of the way," Mom called to William and Joey when they got too close to the movers. They ran to her. "Why don't you go play in the backyard?" she suggested. She shot me a look that asked 'how do you keep up with them?' and I shrugged. I stared at the kids, wondering if they were warm enough in their sweaters, but they seemed comfortable enough. Their cheeks were pink, though. "Yeah, we can play with our treehouse," William said. "Finally." The fact that their treehouse had gone with some of our less used stuff well before we did was a bone of contention between the four of us. Let's just say that small boys are not big on accepting that some things need to be done for the sake of practicality. "Okay, let's do that," Joey replied, his red hair bouncing as he followed his dark-haired brother around the house. "But first let's get our camera so we can send pictures to Christian and Olivia." "And Ben and Anna and Jake from our old class too, okay? I want to take some of the pictures," William told him as they both headed back to the house for the camera. It warmed my heart a little to hear that they planned to send pictures to their friends. When I was little, we moved a lot, and it was hard to keep in touch with people back when letters and long-distance phone calls were the only options for maintaining contact after a move. At least my kids could e-mail the people they left behind � not that they'd left Olivia behind, she's simply gone back to her mother after our disastrous vacation before Christmas left her without a father. From what I'd been told, Olivia was doing as well as could be expected, and I knew that Christian was healthy, so I was glad that they included both children among those they kept in touch with. "Hey," Mulder said, breaking into my thoughts as he came behind me to wrap the arm not holding Staples and grocery bags around me. I smiled, not realizing until then that he'd returned too. "You want to send some pictures to anyone? Maybe the nuns at the hospital?" "Right." I smirked at him. The biggest reason we'd moved was because I couldn't stand working at a Catholic hospital any longer. The nuns hadn't been the problem, but it wasn't as though I'd been especially close to any of them. "No, Mulder. I don't think I'll be sending the nuns any photos." "That's probably for the best. You wouldn't want them showing up to pray for us, or anything." I rolled my eyes. "It's not like leaving the hospital got me excommunicated." "Maybe not officially. We were unofficially excommunicated from the FBI," he said pointedly. I decided that it wasn't worth the effort to explain that being ousted from the church and from the FBI were hardly on the same level. He was probably just toying with me. "You know, I might send some pictures after all." I guess he expected me to say my family because his eyes widened when I said, "To Audrey Parker." "And how are our friends in Maine, anyway?" "Not too bad. They're all still in Haven, and you know what that entails." "As long as no one gets eaten, it's a good week in Haven," he said, deadpan. "Something like that. Audrey thrives on the weird cases they keep getting, so she's pretty happy. Duke for some inexplicable reason mostly e-mails me videos of his cat, Morgan. And I more hear about Nathan from Audrey than from him personally, but they're all doing fine." I wondered if I should add that I'd figured out which of the young men she fancied more, but Mulder wasn't usually into that sort of gossip, so I didn't. "Do you ever wonder why they stay there? There are plenty of perfectly average little towns all over the place up here, and they're...there." "Nathan and Duke were born there, and Audrey's still there looking for answers. It's not that complicated, Mulder. I don't think anyone's holding them prisoner." "You never know," he said cryptically before hefting his bags and heading for the house. "Dad! Come help us with the settings on our camera!" William called, and Mulder shrugged before jogging around to the back yard. I watched Mulder help the boys with the camera, all three of their heads bent to examine it. My mother was right, it was moments like this that you caught people being themselves most thoroughly. "Mrs. Mulder?" a female voice asked behind me, startling me a little bit. For a moment I looked around for Teena before realizing I was the one being addressed. I turned to see a woman approximately my mother's age giving me an uncertain smile. "It is Mrs. Mulder, isn't it? The mailbox... "
"Actually, my husband is Mulder. I kept my maiden name when we married. It made things easier professionally," I explained. "Oh, I see." Her lips pursed in a way that suggested that she might understand, but not approve. I felt like telling her that the boys both had Mulder's last name, but that seemed rather defensive, so I didn't. The neighbor was more interested in other things, anyway. "It mustn't be long now," she said, glancing knowingly at my bulging middle. "Not too long," I agreed. "A handful of weeks." "I'm glad you're getting moved in before your new arrival gets here. Are your older children twins?" she asked, looking towards where William and Joey were snapping photos. Mulder had stopped to talk with my mother about something she was pointing at. "Yes." Sure, why not. "They turned eight in May." "They must be excited to be having a little brother or sister," she said before shaking her head with a rueful smile. "Where are my manners? I'm Judith Sharp. I live across the street." I shrugged. "I'm going to be working at the nearby medical research center." "Oh, you're a doctor. It's a nice place. The son of one of the women in my book club works there." Judith smiled at me, finally looking a bit less like she disapproved of me. "Where did you live before?" "Virginia," I replied, not really caring to list everywhere I've lived. "Most recently." "Virginia. Well, if you need any help getting ready for winter in a few weeks, just let me know." I almost cringed at the thought of it snowing in a matter of weeks. "Actually, my husband is originally from Massachusetts, so we should be fine." "That's good to hear. Winters up here can be overwhelming for novices. All that snow..."
And ice storms, I added silently. "My husband might hit you up for shovel recommendations, but we more or less know what we're in for." "Mom! Do you know where more batteries are? Dad and Grandma don't," Joey called. I looked over my shoulder and saw him and William giving their camera a mournful look. "I won't keep you, dear," Judith said. "Welcome to the neighborhood." "Thank you," I said distracted, mind already on trying to locate more batteries. "You're welcome." She pointed at a gray house across the street. "That's me, over there." "Right. Nice to meet you." As soon as she stepped away, I headed towards the house. Mulder looked grumpy when he came back home after registering the kids at school. They wouldn't start until Monday, but the half-day gave us time to get them registered instead of rushing through it their first day of classes. "Well, registering William was a snap, but Joey..." he trailed off with a sigh, "I got the third degree about his records." "Because of the name change?" I asked. Once we got custody of Joey, we had his name legally changed to Joseph William Mulder, rather than the "William Joseph Van de Kamp" that appeared on his adoption papers and his boarding school records. His new legal middle name was his choice. It tickled him to reverse the order of his names rather than to pick a new middle one, and this was before he and his brother even liked each other. "Because of the name change," Mulder agreed. "I wish the new school didn't care about kindergarten records-" The boys' school in Carter hadn't, "-because it would have made things a hell of a lot easier. Their biggest concern was how we ended up with two boys once legally named William." "What did you tell them?" I asked, curious about what he'd said. I was certain that he hadn't told the truth, which was that I'd lied about Joey's name when I'd placed him up for adoption. He wouldn't have been back in less than an hour if that whole story - about how we hadn't known that Joey was ours when I decided to let people think he was William until I decided that he'd be safer with another family after Jeffery Spender warned me that people would be looking for him - had come out. "I said that it was a coincidence and that we'd had no say over what the people who had adopted him named him, but that he'd gone by Joey since infancy anyway, so we'd legally changed it 'back' when we regained custody of him." "And there were probably a billion questions about why we'd given one twin up for adoption but not the other, but the principal held his tongue." "You really can't blame people for being curious." "Sure I can," Mulder said with a glower. "If not for the name discrepancies, no one would ever have to know about the adoption at all." "You don't think Joey would ever mention it?" I scowled at him, too. It would be nice to wave a magic wand and rewrite the past, but As much as we all loved each other now, we couldn't change what had come before. Joey had been old enough to remember when he'd come back to us. It wasn't fair to expect him to keep silent about five years of his short life. Reading my mind, he waved a hand about while saying, "I know, I know, but I wish..."
I reached up and rested a hand on his shoulder. "And you always will. We both will." "You're right," he agreed, kissing me on the forehead. "You've got a phone call." Mulder stuck his head into the bedroom one afternoon while I was watching TV from the comfort of our bed. Our bed, with its memory foam topper, and a feather topper over that was the only comfortable place left in the entire house. Unfortunately, with all that squishiness on the bed, I needed help getting out of it. He seemed to realize that because he came over to give me a hand. Not long now, I reminded myself for the sixth time that day, and then I'll have my body back. "Who is it?" I asked, taking the phone from him. He only shook his head and smiled before backing out of the room. I stared at the phone for a moment before putting it to my ear. "Hello?" "Hello, um, Dana," a gruff voice replied. "Sir?" I asked, not bothering to hide my surprise. "You don't need to call me that," Skinner muttered before speaking up. "I was calling to see how you and Mulder are liking your new home." "So far it's great. I haven't had much of a chance to explore yet�well, you know. But the kids are happy with their new school, and Mulder seems to like it here too," I said, wondering if I should send him a Christmas card. We kept in touch, sort of, but he wasn't generally the type to simply call someone up out of the blue to chat so I was a bit thrown. "Thanks?" I immediately regretted letting that sound like a question. Pressing on, I asked, "And how are you, um, Walter?" "I'm good." He did sound suspiciously chipper. "Actually, I'm seeing someone new, and she's trying to talk me into a New England vacation for Valentine's day-" I missed the next several words because my brain was still trying to process the fact that he'd just told me a detail about his love life. "-promised I'd ask for suggestions from Mulder since he'd grown up there." "He said we should check out Vermont. Something about Bethany being quite nice, horrible monster he investigated not-withstanding. I told him Janice and I would consider Vermont, but not a town where an X-Files happened." Skinner cleared his throat. "She's an open-minded person, but there are limits." "Of course. I'm sure that no one Violent Crimes takes a honeymoon tour of towns where they caught criminals either." "Uh, it wouldn't be a honeymoon vacation-" Skinner said uncomfortably. "Sorry, I didn't mean to imply that. Just that people don't revisit places like that," I said in what I hoped was a soothing tone. "Yes, right. Anyway, I'm glad to hear you're all getting along well in the new place." "Thanks, and good luck with, um, everything." Mulder was smirking when he returned a short time later. "What was that?!" I asked, eyes still wide with surprise. "An X-File?" he suggested. He ducked when I threw a pillow at him. "How could I forget?" Mulder put the pillow back. "You're not having second thoughts are you?" I asked, suddenly feeling uneasy. "Of course not. I just can't think of another reason Walter Skinner called to ask me for vacation advice." "As mysteries go, this is one for the books." William came into the room a minute later. "Dad, you said you were gonna take us shopping for skates after you talked to your old boss guy. Are you done yet??" "Yes. I'll be right there." As soon as William left, Mulder turned to me with a strange gleam in his eye. "Do you think Skinner would literally die if I got the kids to call him Uncle Walt from now on?" "I think you're making more of a case for homicide than a heart attack." "Yeah, you're probably right. It would be pretty funny, though." He bent down to kiss my cheek. "Do you need anything while I'm out?" I gave him my most winsome smile. "Cheesecake?" "In that case, make sure it's New York style." He groaned in a good-natured way before heading out, taking the boys and their noise with him. I wasn't lonely, though. The baby kicked now and then as I snuggled back on the bed, reminding me that she'd be there soon too. "Cherry this time, right?" Joey asked anxiously. The counter in front of him was covered in a flurry of flour. I'd meant to wipe it up as soon as he'd spilled it while playing with the rolling pin, but my back was bothering me so I'd decided that it could wait. That might have been a mistake because it was drifting down to the floor already. Joey's favorite food in the world was pie, and he'd been begging me to make another pie since Thanksgiving. The problem was that he wanted to make it himself this time � with my oversight - so scheduling that was tricky considering how much had to be done before the baby came. Finally a day arrived when everything seemed to be well in hand, so Joey and I were making pie while Mulder and William assembled the mobile they'd been making the baby: it had dragonflies with gossamer wings, and while it wouldn't do much for her brain development as the black, white, and red ones sold by toy stores, it was beautiful and fit the theme of her nursery. "Yes of course the pie will be cherry. I promised that we'd make a cherry pie, so we are." I shook the bowl of cherries I'd pitted to make my point. My mother would have suggested canned cherries, but I was afraid a lot of our meals would involve cans over the next few months, so I was going to enjoy making something from scratch while I still could. "Thanks, Mom. My old mom would never let me roll the crust," Joey told me, waving the rolling pin as he spoke. He noticed. "I promise I'll be more careful and not knock anything else over." Joey quickly put the rolling pin back on the counter. Despite his promise, I could tell that he was worried that he'd upset me by mentioning his other mother. "No, it's not that-" Not either of those things, actually. We both looked down at the floor. Joey's expression became puzzled. "Did I spill water on the floor too? I thought it was only the cup with flour." "No, you didn't spill water." I said, trying not to grit my teeth. "Go tell your dad I need him, okay?" "Oh! Like that movie last week!" he yelled, jumping off the stool Mulder had set him on so he could reach the counter. As he ran out of the room, I could here him continue to yell, "Dad! Mom's gonna have the baby. Right Now!" I thought about yelling back that it wasn't going to be as quick as the movie, but I didn't bother because I doubted I could make myself heard over the commotion in the living room. Mulder appeared, followed by our anxious sons, a moment later. "So, I take it that your water broke." "Correct," I said, gesturing to the puddle between my feet. Thank god I'd had the impulse to wear a dress. It was ugly and shapeless, but I'd been expecting to spend the whole day home so fashion had been the least of my concern. "Should I call 911?" William asked excitedly. "The said in health that you gotta call an ambulance when there's an emergency." Mulder deferred to me with a look, and I sighed. "Babies take a lot longer than on TV. We talked about that, remember?" We'd spent the past three months carefully explaining what would happen when I went into labor, but they both seemed to have forgotten everything. "Most women don't need an ambulance to make it to the hospital on time." "So we don't need to boil water?" Joey asked, looking disappointed. My brow wrinkled in confusion. "What? Boil water? Did Grandma show you Gone With The Wind?" Fantastic. I looked to my husband for help, and he straightened up and tried to look authoritative. "No water. What I need you both do right now is to go and get your boots and coats on. Then wait by the door. Go!" They took off like hyperactive puppies, but I could hear the coat closet door open, so I figured that they were following directions. Mostly. "You can't blame them for being excited," Mulder told me as he led me back to our room so I could change. I took the pair of sweatpants he handed me and tried not to grimace. I should have been even less concerned with looking fashionable than before, but the thought of going out into public wearing sweats didn't make me happy. "I know�"
"And I can't blame you for feeling irritable," he added with a grin. "You're familiar with my grizzly bear impersonation when I'm in pain." "I believe I've poked the bear a time or two, yes," I replied as I slipped a sweater on too. "Or maybe the bear poked you," he suggested, bending to tie my shoes for me. "Isn't that how we got into this mess in the first place?" Not this time, I thought, but I didn't ruin his quip. With William, though�I found myself remembering a night that had begun with a campy movie and beers and ended with a conception. At least theoretically. There was no way of knowing when exactly I'd conceived, or even if it'd been a-not-so-failed IVF attempt just a couple of weeks prior, but I liked to think that it was that night, one of the last perfect ones before everything went to hell for quite a while. I must have looked far away because his expression faded into concern. "Are you nervous?" My hand fluttered up before flopping back onto the bed. "I don't expect an alien audience, so what's there to be nervous about?" "You don't need to pretend," he said seriously. I took his hand and he hauled me off the bed. "It's just me right now. You don't have to be strong for me." "All right, I'm a little nervous," I admitted. "My mother said that she was every single time." "Most women are, probably. It's completely natural. I'll tell you, I'm nervous as hell myself." "Mulder." I grabbed his wrist. "I'm going to be fine. The baby will be too. You'll see." To my surprise, he laughed. "That's not the part I'm worried about, at least not mostly." "Then what?" My thoughts were focused so sharply on the hours ahead that my mind didn't have room for much else. "We're going to have a daughter. Everything's going to be different this time." "Yes, it is," I said fiercely, thinking about the silent crowd as I gave birth to William and our shock years later when the DNA results said that Joey was ours too. How could it not be different? "Well," Mulder said, offering me his arm. "Let's get this show on the road." The boys were fidgeting by the door, but both were dressed and one of them had dragged my packed bag out of the closet as well. Mulder ruffled their hair before giving them the keys and instructing them to go and unlock the car. Joey took the keys and William hauled the bag out with them. As for me, I leaned on Mulder the whole way out. The room was nice. The hospital's ads had called it a "birthing suite" but I was struck by how much it looked like a bedroom in a furniture store showroom. Mulder had picked it out, desperately wanting me to have a better birthing experience than I had the first time. I didn't have the heart to tell him that a room with bright lights and running water, but minus dust, cobwebs, and alien replacements would have sufficed. This baby was in more of a hurry to arrive than William had been, so I had little chance to enjoy the supposedly homey environment. Mulder seemed disappointed that I hadn't gotten the chance to soak in the fancy tub before entering active labor, but I really didn't mind. Mulder apologized every time he left the room to go see how the boys were, but I was getting so much attention that I hardly noticed his brief absences. The important thing was that he was there and wasn't going to miss our youngest child's birth, so how could I fault him for checking in on our older kids? We'd briefly discussed the idea of having the boys present too, but they'd asked if they were being punished with seeing gross stuff, so we decided against that. Therefore, they were hanging out in a room nearby meant to keep kids occupied while they waited for good things, like the birth of a sibling, or worse ones, like learning if someone survived emergency surgery. I'm sure they were the happiest kids there, all things considered. Time seemed like it was fading into slow motion and being fast-forwarded both at times which was a bit disconcerting. Before I quite knew it, the doctor was standing between my legs, and hoisting a mewling infant into the air, much like the beginning of the Lion King video William has made me watch 87 times. "It's a girl," Doctor Gardner declared, as if there had been any doubt. I felt a stab of anxiety for a moment, and worried that the doctor was going to run off with the baby, but she soon put the baby on my chest so I could get a good look at her, and I felt foolish for worrying for no reason. Mulder leaned over me, getting a good look at our daughter too. "This one doesn't look like Skinner," he said solemnly. I couldn't help but choke out a laugh when the nurse raised her eyebrows. "No, not with this much hair." Mulder reached out and gently ran his finger over it. "This is a lot more hair than I was expecting." "Some babies are like that," I said, yawning. "There are family pictures to show that Bill was." He scowled at me. "Let this be the only way our girl takes after her uncle." "From your lips to God's ears," I murmured. Up until that second, the baby's eyes had been screwed tightly shut, but she opened them and stared up at Mulder in that unfocused way newborns have. I was half surprised that no one called for a mop, because he melted right then and there. "Hello Autumn, we've been waiting to meet you." "Where are the kids?" I asked anxiously once the baby and I had both been cleaned up. When the room emptied out of the assorted medical staff, I found myself longing for the rest of my family. "They're still in the lounge waiting for your mom-" Mulder started to say, but as if on cue the door opened, and two smiling little boys appeared. "Come meet your new sister," Mulder told them, holding the baby so they could see her. Their expressions were an odd mix of being shy and eager both, but they got over the shyness soon enough. "Aww, she's so tiny!" William cooed. "We were never this small." Joey grinned and looked from me to the baby. "She looks like you, Mom." "And you," I told him, reaching over to tweak his nose. "Yeah, kind of," he agreed. "Dad and Will are gonna be out-numbered now." "Three redheads in one house, heaven help me," Mulder moaned, making us all laugh. "It didn't kill my mother," I pointed out, "and she had four of us." "We'll have to get pointers from Grandma," William told Mulder conspiratorially. Joey immediately stuck his tongue out at him. "Yes, we will. Do you guys want to hold her?" Mulder asked, and their faces lit up like they had no idea that they'd be given the opportunity to do so. "Okay, we have to support her neck like this." Mulder demonstrated. They nodded eagerly and held out their arms. A nurse wandered back in, reminding me that there was a lot more oversight if you gave birth in a hospital. She glanced over to where the boys were sitting with the baby. Mulder already had his camera out, though I could tell from his posture that he was ready to spring into action if they had any trouble holding her. "What's your sister's name?" the nurse asked, though she could have easily looked at the baby's chart to find out. "Autumn. It's like an old fashion way to say fall," William told her proudly. The nurse was surely used to being "taught" such information by young children because she just smiled and nodded in acknowledgement. "That's a lovely name." Turning to me she asked, "Is it a family name?" When we'd first learned that it was a girl, Mulder tentatively suggested Samantha or Melissa as names, but I'd flatly refused to consider either. The weight of being a dead girl's namesake seemed like too heavy of a burden for an innocent baby. The nurse looked like she wasn't sure how to react. "I bet she'll be the only girl in her class with the name." "Not like Madison G. and Madison W. in our class." Joey piped up. "They hate that." "I bet," she said before beating a hasty retreat. "When are you gonna come home?" William wanted to know. Before I could say anything, Mulder answered for me. "In a couple of days." "The doctors need to know that Mom and Autumn are both healthy first," he explained, and I was glad that he didn't launch into an explanation about HMOs and too-short hospital stays that'd caused lawsuits during the 90s. They both looked disappointed. At least until a familiar face appeared in the doorway. "Grandma!" Mulder murmured, "Your flight okay?" and she simply nodded. I have to give my mother kudos, she made a fuss over the boys for a minute before coming over to see the baby. Mulder had snagged her back the moment the boys got wiggily, so she didn't suffer in their exuberance to see their grandmother. "Oh, Dana, Fox, she's gorgeous," she gushed as soon as Mulder lowered the baby into her arms. "She's simply perfect." "Of course she is," Joey remarked in a way that suggested it should be self-evident. After a little more cooing over her newest grandchild, she gently handed Autumn to me and fished about in her jacket pockets. After a moment she produced another camera. "I thought you boys could help me take some pictures to send your uncles before we go to get ice-cream." "You know an all-night ice cream place?" Mulder asked, looking amused. "Ah, he doesn't know, does he?" she asked me. "I don't know what?" Mulder looked confused. "You're not the only insomniac, Fox," she explained. "Ever since the captain died, I've had trouble sleeping many nights. The first thing I do when checking into a hotel is find out what the hotel restaurant hours are, and this hotel has an all-nighter." We'd tried to convince her to stay with us, but she'd said something about wanting to be able to come and go without disturbing the baby, so she was staying in a hotel half an hour away. To be honest, I didn't mind, because she'd been a bit suffocating when William was a newborn...not that I hadn't brought it upon myself by going back to work when he was days old. "It's okay for us to eat there even though we're not guests?" William asked, looking worried. "As long as you're with me, no one will mind," my mother assured him. "And they really have ice cream?" Joey wanted to know. "Cross my heart. It's on the menu, I checked." "Well, don't keep them out too late," Mulder replied, trying not to look amused. He failed. "I won't. You'll pick them up on your way home tonight?" A selfish part of me wanted him there with me all night, but I was fighting sleep as it was, and I knew he'd be better off home with the kids than sitting by my bed watching me sleep. And he'd be back bright and early. "No problem." She turned to address Joey and William. "So how about those pictures?" I'd lobbied for being released from the hospital exactly forty-eight hours after Autumn was born, but the hospital hadn't liked that. Apparently releasing a newborn that late at night, especially on a Sunday, wasn't their idea of proper protocol, so I'd had to wait until eight the next morning. That meant that I didn't get to see the boys before they went off to school. This made me a little sad, but they'd missed enough school during the upheaval of the move to make me feel selfish about wanting them there. I tried to keep my disappointment to myself so no one felt guilty. Mulder acted like Prince Charming, and like the baby and I were made of glass. I probably should have assured him that we'd both be fine with less delicate handling, but he seemed so happy about it that I just let myself enjoy being spoiled a little. Eventually, in less time that it seemed to take to drive to the hospital more than two days earlier, we were finally home. It had snowed a little in my absence, but otherwise it looked completely unchanged. I don't know why I expected it to be different, but it was comforting that it was not. "Let me get the door for you," Mulder said before scrambling out of the car. I watched him come around and open both my door and the rear passenger side one. A feeling of deep calm overcame me then. This was right. This is how it's supposed to be when you bring a brand new baby home from the hospital. No aliens, no specter of death, just a couple and their little child. It was nice to feel like the part of a normal family, and I thought that moving far away from the X-Files and all that entailed is what earned me this mundane pleasure that so many other people took for granted. When William and Joey came home, they tip-toed through the door, much to Mulder's amusement. "What are you doing?" William gave him a crooked smile. "The baby is in the house." "Well, we didn't want to wake her up," he explained. "Everyone at school who's got a little brother or sister told us that you have to be real quiet when there's a new baby in the house," Joey added. I laughed. "The kids who told you this, do they also complain that their little brothers or sisters wake them up crying at night?" "They said that happens a lot too," William admitted. "Isn't that how babies are?" "All babies wake up crying some nights, but a really good way to make sure that happens a lot is to make it really quiet in the house during the day so the baby sleeps really well then. Preventing normal daytime noises makes it harder for the baby to learn to sleep through the night." I could see the gears turning in their minds. "So�"
"So I don't want you to be quiet during the day unless your dad and I ask you to, okay? It'll help us teach Autumn to sleep through the night." "Oh, sure. We'll help now by playing Lego Batman," William said. Glancing at Mulder, I could tell that he was about say that they didn't need to make extra noise, but I caught his eye and shook my head. They probably would forget to be noisier long before they forgot that they didn't have to make a particular effort to be silent. "I want to play too," Mulder announced, surprising me. As he walked by, he leaned down to whisper to me. "I've read parenting books too. They all say to pay extra attention to your older kids when you can." "Good idea." I kissed his cheek, and sighed when I heard the baby crying. "I'm being summoned." He smiled and headed for the living room himself. I wandered to the refrigerator, intending to get myself a glass of water before going to feed the baby. When I opened the door, the first thing I saw was the bowl of cherries sitting on the shelf. As you can imagine, they were pretty much ruined given how long they must have sit out before someone thought to scoop them up. Sighing, I promised myself that we'd make a pie before Joey thought to feel bad about it. But I thought I'd have to send Mulder to get replacement cherries, since I couldn't imagine dragging my daughter through Market Basket or Shaws this week, unless there was a dire diaper emergency. She couldn't really go through all the diapers we'd bought that quickly, though, could she? Later that night, after everyone else went to bed, I stood in my daughter's nursery, making her silent promises as she slept in her crib. Daddy and Mommy don't work a dangerous job anymore, and we promise we never will again. Because Daddy and Mommy don't work a dangerous job anymore, You'll never be separated from Daddy and me. Not for a little while like William. Not for a very long time like Joey. This time I will get it right. Mulder let the boys hammer a gaudy plywood stork sign announcing "it's a girl" into the ground near the front steps, so it wasn't surprising that Judith arrived for a visit the day after Autumn and I got home from the hospital. Judith came armed with a brownie pan and a smile. "I thought your children might enjoy something sweet," she said. "I remember that my mother didn't have time to bake the times when I had a new sibling." "Thank you," I said, returning her smile. I never did much baking as it was, but she was right - I sure didn't have any time to make brownies for the kids. I took the pan from her with a grateful smile, and wondered idly if this would help postpone the impending pie crisis. "I'm sure they'll be thrilled." She gave me a hopeful look, and I wasn't surprised at all when she asked, "Is the little one sleeping?" "Actually, I think she might be awake. Let me go get her. Come on in." It was the first time that she'd been in our house, and I could see her eyes studying it in a way that suggested that she'd been very familiar with how it had been before we'd moved in. For the first time I wondered if she'd been close to the former owners. She eventually noticed that I'd been watching her, and smiled. "I can't believe how together this place looks already. You'd never know that you'd only moved in three weeks ago." "Thanks," I said, enjoying the sincerity of her compliment. "I'll go check to see if the baby is awake now." Autumn was quiet when I entered her room, but awake, so I scooped her up and brought her down stairs. "Here she is," I announced, allowing Judith to take her from me. "Oh," Judith cooed. "Aren't you darling? She looks like you." "To my husband's relief," I said, amused by his reaction the night she was born - I think he was even more relieved that she didn't look like our former boss or Winston Churchill. "Why? He's a handsome man." "He knows. But to quote him 'handsome isn't an adjective that any man wants to hear describe his little girl.'" "That's true." Judith laughed. "I've been thinking, you'll probably need a babysitter now and then." This flustered me. "I couldn't ask you to-"
But I stopped suddenly when Judith began to chuckle again. "Me? No, my babysitting days are past me. Unless there is an emergency, mind you." Puzzled, I asked, "then who did you have in mind?" "Leigh Blackwood." When I gave her a blank look, she continued. "Leigh is twenty-four, and her husband wants her to stay home with their little boy, Jacoby." She looked up at me with a wry smile. "His daddy is a Red Sox fan. But, like most young mothers, earning a little extra spending money is never a bad thing. She has quite the reputation for being children's favorite. She'll be over my place tomorrow if you'd like to meet her." "She sounds lovely," I glanced down at the baby in her arms, "but you must realize that I'm not ready to leave Autumn with anybody." I was barely ready to let other people hold her. "I know, but you never know when you'll need somebody to bring the boys home from school," Judith said reasonably. "It would be a lot less awkward if you'd least known each other well enough to say hello before you asked for her services." She probably had a point. I remembered my own childhood, the frequent moves we made because of my father's military work, and my poor mother having to ask complete strangers to come sit with us during various emergencies. "Thank you, I appreciate the opportunity to meet her." I'd meant to get to Judith's at the time she suggested, and it should have been easy to considering that she lived just a few hundred feet away, but one of my sons had other ideas. Joey followed me around the house as I got ready to leave, looking slightly alarmed. "Across the street to see Judith." "Are you taking the baby with you?" "What if Autumn needs something?" "Your dad will be here, so she'll be fine." "But what if Autumn needs you?" he persisted, and from the way his cheeks pinked up, I knew what he was trying to get at. "I just fed her five minutes ago. She should be fine for a couple of hours." "Come here," I said, putting an arm around him. "It's good of you to look out for your sister, but she's going to be just fine." He gave me a sheepish smile. "I just want her to be okay." A half-hearted remake about being a worrywart died in my throat when I realized that he was thinking about Ava Van de Kamp. His adopted sister had died horribly, so no wonder Autumn's birth had stirred up anxiety. "She's going to be just fine," I said firmly. "We all are." "I'm going to go now, okay?" "Okay." He glanced at his watch. "You have an hour and fifty minutes." "You," I laughed, and finally made my way to Judith's. "Sorry I'm a little late," I said as Judith opened the door for me. "Joey needed to talk out something he was worried about." "No problem. I had three boys of my own, so I know what it's like. Leigh and her little Jacoby are in the kitchen." Jacoby Blackwood turned out to be an adventurous two-and-a-half-year-old boy who had blond hair and blue eyes like his mother. Judith seemed prepared, because she'd used a baby gate that I was surprised she owned to block off the stairs in her house. This did not stop Jacoby from trying to scale it, but it was just too high. I watched with interest, waiting to see how Leigh would react. She calmly redirected him, and eventually gave him a toy that distracted him altogether. He played happily with a sturdy toy car, having forgotten all about his quest to get over the baby gate. "Spirited," Judith commented, giving the boy an indulgent smile. Leigh nodded, not looking at all embarrassed. "He gets it from his daddy. His mother said that they had to cover the top of his crib by the time he was a year old, because he just kept jumping out head first. At least this one isn't quite that determined to earn himself his set of first stitches. He spends a lot of time in a playpen when I mind other kids. So far, he's never staged a successful jail break." Judith glanced at me. "Dana's little guys are long past the stage where someone needs to keep an eagle eye on them." "Judith said that they're eight?" Leigh asked. "Um... are they identical?" Leigh looked slightly anxious. "That'd make them hard to tell apart." "No, fraternal. They have different color hair anyway, so you should be over the keep them straight." They hadn't had different color hair as babies, but their hair was no longer colorless infant fuzz. She looked relieved. "Oh, good. That must make things easier on everybody." Judith smiled at us. "Now that introductions are out of the way, pound cake?" "That'd be lovely, thank you," Leigh replied. "Leigh, you know where the high chair is," Judith said before looking down at Jacoby. "Oh no, I didn't forget about you, young man. I saw you perk up when I said cake." "Yummy," Jacoby said, apparently pleased that the adults weren't going to be leaving him out. This made our hostess laugh, and Jacoby squealed happily as his mother swooped him up from off the floor and plopped him into the high chair, a piece of furniture that suggested that Judith and Leigh were close enough to visit each other often. Watching Leigh interact with her son left me with a good feeling. She was definitely good with children, and I thought I'd feel comfortable with her watching mine. Christmas went as smoothly as I could hope for, considering that Mulder and Bill were in the same house for more than twelve hours. Hosting the holiday at home had been the right decision, baby-wise, and probably a lot less stressful than trying to drive to their house with a newborn would have been. Still, we were still finding bits of wrapping paper in odd places two days after Christmas, along with parts of the kids' toys. They swore that nothing had been broken, but it didn't stop Mulder and me from spearing our feet with colorful bits of plastic whenever we dared skipping slippers. I'd just picked up a tiny light saber off the floor when the doorbell rang. I put it down, not worried that it would soon find its way back into the carpet, and answered the door. Judith was standing there, smiling at me. I found her expression a bit unnerving, and soon learned what had put that expression there. "Hello, dear. How was your Christmas?" "Lovely. I saw my boys, and it's hard to improve upon a day like that." "You're probably wondering why I've come by." "I wanted to talk to you about New Year's Eve. You'll come to the party at the town hall, of course," Judith said, as if I'd agreed to something. "Judith, I don't think any of us are up for a late night-" I started to say, but she cut me off. "Don't worry, it's not a late night at all. There are so many old codgers in town that we don't literally ring in the New Year. Not at midnight anyway. The party starts at seven, and you can be cozy in your bed by ten if you want. Most of the young people move the party to Branagans Pub, but that's the under 40s, you know." "There will be a lot of kids there," Judith said serenely. "That's the rest of the reason it's so early. I suspect that most of your sons' classmates will be there, so they'd have fun too." "I," I muttered weakly, shoulders falling. "I'll ask Mulder if he wants to go." "Great!" Judith's face brightened. "There are so many people you need to meet. They've been politely holding off swarming you because you were expecting the baby, but now that she's here, you can show her off and get to know the rest of the usual suspects in town." "Oh, okay," I said, defeated. "Dana, are you quite all right?" my mother asked me when I backed into the house shaking my head. "You look like you've just gotten some bad news." "No, I was just bulldozed into doing something." Mom looked confused. "Wasn't that your neighbor? I thought she seemed nice." "She is nice. Pushy, but nice." "Oh. What did she twist your arm for?" "She wants us to attend a party at the town gym, so she can introduce us to people." "That doesn't sound so horrible. You really do need to get to know folks." "You say that like I've become a hermit. I've got a two-week-old baby, Mom." "I'm aware of that, Dana. But you shouldn't use the baby as an excuse to hole up and keep to yourselves. It's not healthy." "Jeez, Mom�" For a second I was glad that she was going to be going home that night, but then I instantly regretted the thought. I was lucky that the holidays had kept her around for as long as she'd been. After two weeks away, she was probably eager to get home but I would miss seeing her so often. "It'll probably be more fun than you think, sweetie. Try to enjoy yourself, you're going to know these people for a very long time, so when better to meet them than now?" Deep down I knew that she was right. We wouldn't start to feel settled until we got to know the folks in town, and as overwhelming as going out with the baby seemed, the sooner I got it over with, the better. "You're right." "I know, but I'll try not to rub it in." Seeing my mother off had made me feel a bit overwrought, and the boys had been cranky too, so it came as a relief when Mulder supervised them as they got ready for bed, leaving me with just the baby to feed. I looked up when Mulder came into our room. "Are they happier now?" "They're going to miss being spoiled by your mother, but I think they'll be less grumpy after a good night's sleep. How is our little sweetheart?" Mulder asked, slipping his finger into Autumn's grasp. At the word 'worry' I finally remembered something I'd been meaning to tell him for days. "She's not worrying me, but Joey is different story. He's worry about her." "Why?" Mulder asked before immediately saying, "Oh. Ava." "Yes, because of poor little Ava." Joey didn't talk about Ava much, but he said enough for me to know a little bit about her. She'd been blonde, had down syndrome, and had been a cheerful toddler who hadn't yet reached her second birthday before her adoptive father forgot to bring her to daycare on his way to work, something that had turned out to be a fatal mistake. "Joey has nightmares, sometimes, about what she must have suffered in that hot car," Mulder told me quietly. "He does? He never told me that," I said, both appalled and surprised that this was the first I'd heard of it. "I don't think he wanted you to know. But he told me not long after we told them about Samantha," Mulder said, referring to a conversation we'd had the summer we'd gotten Joey back. "Are your sisters something you talk about a lot?" I asked, thinking about the sad bond that they shared. "No, just sometimes. I think I need to have a chat with him about how worried I was when Will was born, and how I finally realized that Samantha's death didn't mean that all the children I loved would be doomed." I hadn't thought about that either. I studied him for a moment, wondering what it must've been like for him, considering that William was born so soon after Mulder discovered what had happened to his sister. He must have been terrified. Obviously he had gotten past that, and I hoped that Joey would heal long before he had children of his own. "I think that might make him feel better, Mulder." Something I'd managed to forget over the years was how much longer everything took when you had a baby with you. By the time we'd gotten the baby fed, and changed, packed a diaper bag and got the boys to actually put on their boots and coats rather than continue to play (they claimed we were taking "forever" and didn't see what the sudden hurry was), we were out the door much later than we intended to be. The fact that I didn't really want to go didn't help me get ready any faster myself. Parking was tight by the time we finally got to the town gym, but Mulder managed to squeeze us in between a Jeep and a Prius. The kids bounced out and ran for the doors like they knew where they were going, which I was pretty sure that they didn't. I didn't even bother to yell at them not to run because Mulder, with his long legs, managed to catch up to them quickly. "Looks like it's you and me," I murmured to Autumn before trailing after them. The baby, cozy in the sling I had shrugged on, was indifferent to our outing so it seemed that I was the only one who was feeling apprehensive. I'd barely stepped inside before a gentle hand landed on my arm. "There you are," Judith said, sounding like she'd expected us to arrive sooner. She probably had. "Come along, we've got a lot of ground to cover." Judith led the way, making a beeline for the corner of the room. Her no-nonsense stride reminded me of the nuns bringing us to the restrooms in first grade. "First, there's someone I want you to meet before she leaves. She'll leave earlier than the rest because she's getting on in years..." we seemed to reach our destination when we came to a stop in front of a woman with pure white hair. Judith smiled at us both, saying, "Hattie Copeland, this is Dana Scully. Dana, Hattie." "Nice to meet you," I said, noting that Judith wasn't kidding when she said that the woman was getting on in years. She was eighty if she was a day, but there was still a sharp look in her eyes, making me sure that whatever ills she might suffer due to her age, none of them touched her mind. "And you too, dear. But I'm afraid I'm about to leave." "Oh." I knew we were late, but the party had gotten underway less than an hour before. I watched her get to her feet a little more spryly than I would have guessed she could. It gave me hope that my mom had a couple more good decades in her, too. "I love talking to new residents," Hattie told me. "If you get the chance, why don't you stop by the historical society some time soon? I'll fill you in on all the town's colorful figures and scandals." "If I get the time, I will," I promised, suddenly wondering what sort of scandals could possibly have happened here in this sleepy town. Then the thought that Peyton Place was based on a New Hampshire town crossed my mind. "Good," she said firmly. "I'll see you then." I was still watching her leave when Judith decided to steer me over to a knot of people across the room. One of the men looked about my age, the woman was younger by a decade, and the other man was younger still. "This is Max Kirby, a reporter for the Ballyguest Gazette," Judith said, referring to the young man with dirty blond hair and blue eyes who looked more likely to ask you for help with his college homework than to interview you. He reminded me of Ricky Flint, and I bet people made the same mistake of underestimating him too. He gave me a curious smile. "Have we met before?" I blinked. "Not that I know of, why?" I supposed it was possible, but only if he'd lived somewhere else a long time ago and interacted with Mulder and me during an old case. "It's just that you looked at me like you thought you might recognize me." "Oh. You remind me of the PI I hired a couple of years ago." Max's eyes gleamed. "There's a story there." "One that I intend to take to my grave." "Of course," he replied easily, but I could tell that he was just agreeing with me out of habit. I'd just met the man, but I was already sure that he didn't let go of interesting things that easily. Judith guffawed. "Dana, by the time you leave tonight, he'll have found something he thinks he can interview you about." "Hey, you can't blame me. New blood is the only way to get any interesting stories into the paper." "And God knows that you have trouble getting the chief editor to let you publish what you write," the woman muttered, and the young reporter looked wounded. "He doesn't like me, that's all there is to it." "Maybe you shouldn't have dumped his daughter the way you did. Bad career move there, kiddo." Before Judith could continue introductions, the woman held out her hand to me. "Celia Maddox." "Doctor Dana Scully," Judith corrected. "Celia is our local fortune teller," Judith said in a completely non-judgmental way. This had me revising my opinion of my neighbor. "I do both palm and tarot readings," Celia told me. "And this is Russell Carr. He oversees the museum in town," Judith explained. The man with a graying ponytail also shook my hand. "A museum?" I asked, surprised by both the fact that the town had a museum I'd never heard of, and the fact that a man who looked a lot like Langly might be a curator of one. "Don't get excited, it's rather small," Russell told me. "What sort of museum is it?" I asked. "Eclectic," Max supplied. "You'll display anything people give you, won't you, Russell?" "More or less," he admitted. "Beggars can't be choosers, not this far from metropolitan areas and their extensive grants." Max snorted. "Like the collection of Martin Van Buren beer steins you've got on display." "It was a very generous donation," Russell said, defending the donator. "Only one hundred sets were ever produced." I was about to try to say something polite when Autumn squawked and drew attention to herself. Apparently it was her way of telling me that she was sick of being in the sling, so I pulled her out of it. "Oh, what a little doll," Celia gushed. "Judith pointed out your handsome little boys when they came in with your husband. You must be thrilled to finally have a daughter." I flinched minutely. "Actually, Autumn is my second daughter," I said quietly, eyes on the baby rather than the adults around me. "I had a daughter who died very young, before my sons were born." "Oh." When I looked up I was ringed by sympathetic faces. This made me want to babble on about how short a time I'd had with Emily, but I held my tongue. It wasn't the sort of story to be blurted out to strangers. I nearly always squelched my desire to speak to people about Emily...I think I was afraid that people would challenge my claim at maternity, or worse pity me for holding on to those too short days I knew her. "You should spend a night at Memory House," Russell Carr said enthusiastically, only to have Celia elbow him in the ribs. "Russell!" she hissed, making him shrug. Her reaction piqued my interest. "What's Memory House?" Russell took two steps away from Celia before smiling at me. "Why, it's our world famous inn, of course." "An inn?" I asked, trying not to shudder; one could only hope it wasn't also the home to a hungry shape-shifter. "What's famous about it?" "Not the food," Russell said with a grimace that said he'd eaten there. "People come there for something else entirely." Celia rolled her eyes. "You'll have to excuse him, he thinks that being cryptic builds interest. Allegedly the inn allows grieving parents to connect with their dead children." "'Allegedly'," Russell huffed. "There have been too many reports to dismiss it out of hand like our dear Celia would like. You would think that a fortune teller would have a more open mind." "I dislike charlatans," she said, sniffing disdainfully. I stared at them, trying to read between the lines for a moment before giving up. "The inn's what, haunted?" That theory was less absurd than the possibility that people thought it could resurrect their dead children. Slightly less absurd. Celia shook her head. "No, nothing like that. God forbid that they try to claim that something other people could observe was happening...their dubious claim is that parents who spend the night there can meet with their children in a dream space." "The theory goes that dreams are a where, not merely a what, and that the dead can pass into it more easily than the conscious world," Celia recited with a roll of her eyes. Clearly she didn't believe what she was saying. "Don't blame me for the trite claim, it's in their brochure." "It explains why we so often dream of the dead," Russell asserted. "Sure, that's a much more reasonable explanation than the fact that we just miss them so they're on our minds." I was trying to think of how to respond when I noticed the predatory gleam in the young reporter's eyes. Apparently Celia did too because she threw up her hands and told Russell, "Now you've done it." He gave her a blank look. "Done what?" Instead of replying, she pointed at Max, who interpreted the gesture as a suggestion that he share his thoughts. "You've all given me the best idea for a story." "This ought to be good," Celia muttered, but he ignored her. Turning to me he asked, "Doctor Scully, I detected skepticism on your face, didn't I?" Russell looked disappointed, but my admission seemed to please Max. "Great!" "I keep telling the chief that I want to do more weighty stories than the usual kittens in trees and Taxpayer Association meetings, but he says I need to bring him an idea worth committing to paper before playing 'investigative journalist.'" It was clear that this was a direct quote from his chief editor, and one that had frustrated the young reporter. "I think he'll love this." "You realize that none of us have any idea what 'this' is, don't you?" Judith asked, reminding me that she had been listening all along. "Right, right. So, it's like this: I do a story about two guests staying at Memory House -one guest who thinks that they'll contact their dead child, and one who doesn't. Doctor Scully can be the one who doesn't, and I can just hit up one of the guests for the 'does' side of the story." "Three guests," Judith said, and everyone turned to look at her. "If you want to be scientific about it, you'd need a control, a guest who's unaware of the inn's reputation." This seemed to take some of the wind out of Max's sails. "Oh, I didn't think of that." Russell tried to salvage Max's idea. "Doctor Scully, do you know someone else was lost a child?" "I'm sure she belongs to a club or something," Celia said sarcastically with a roll of her eyes. "That'd be cheery." My thoughts first turned to my mother, but Missy hadn't literally been a child when she passed away. "My friend John lost a little boy," I found myself admitting. Why was I saying anything when I didn't want to be roped into this? I guess there's such thing as being too honest. "That's great," Max said enthusiastically. When everyone glared at him he turned red. "Well, not great but... do you think you could talk him into coming up here some weekend soon?" "If the story is approved the paper would pay for the accommodations," Max quickly added, apparently thinking that my hesitation was monetarily based. Celia, however, was eyeing my daughter. "You realize you're asking this favor of someone with a brand-new baby, don't you, Max? It's hard to get much REM sleep when you're getting up to feed a baby every two hours." I flashed her a grateful smile, assuming that this would deter the reporter. I was sadly mistaken. "Can't your husband look after her for just one night?" Max asked. "I mean, they have those pump things in the baby supplies stores..."
"Jesus, Max," Celia groaned, covering her face with her hands. "No woman's ever going to marry you," Russell said mournfully. Max simply looked confused. "Because I'm practical?" "Presumptuous," Russell, Celia, and Judith declared as one. "I don't see what's so bad about-"
I looked at Judith, willing her to decide that she needed to make more introductions. No help there. My eyes looked past the streamers and paper decorations shaped like horns and champagne glasses, hoping to see Mulder trying to flag me down. When I did spot him, he was helping the kids get glasses of sparkling cider. Darn. At last I spotted another familiar face. Turning to Judith I said, "Oh look, it's Leigh. It'd be rude not to go and say hi." "You're right, and I wanted to introduce you to her husband Aaron, too," she said, and I assumed that she meant the tall sandy-haired man playing with little Jacoby. "It was nice to meet you all," I said preparing to back away from the group of people. "Wait!" Max said loudly. I cringed a little and looked at him. "Will you consider it, if I can get story approval?" "I'd have to talk it over with my husband," I demurred. Mulder was capable of looking after Autumn himself, especially considering that we had invested in a breast pump already so he could, but I was sure that he wouldn't be thrilled about doing so overnight this soon. "That's fine," Max said cheerfully. "I'll let you know what the chief says." Judith gave me an encouraging smile as soon as we were out of earshot. "The chief really doesn't like that boy. It was a horrible breakup." I took that as her way of saying that the story was unlikely to get approval and began to feel better. Leigh smiled when she noticed us approaching. Since she was scarcely taller than me, she had to tug on her husband's arm to get his attention in the noisy room. "Honey, this is the new mom I was telling you about." He smiled down at me. "Aaron Blackwood, nice to meet you." "Dana Scully," I said smiling back. "Guess what," Leigh said with a broad smile. "Your boys are in Aaron's class." I blinked, surprised but not displeased. I'd known in a vague sort of way that they had a male teacher, but haven't really taken note of his name. The kids and their school had been more of Mulder's thing while I'd been so distracted with baby issues. "How nice." "Aaron and his best friend Christopher surprised and pleased the town when they not only got their elementary education degrees, but agreed to come back here to teach," Judith said proudly. It must have been a fairly recent decision, I concluded, because Aaron couldn't have been older than his mid-twenties. "I was happy to hear that they had a male teacher," I said, "because I read about how much difference that can make to little boys." "I-" Aaron started to say, but got cut off by voices calling "Mister Blackwood!" Joey and William gave me a quick hug after they dashed over to us. "Are you enjoying yourselves?" I asked, assuming that they were. "Yeah, Mom, and this is our teacher!" William said with all of the awe of introducing a celebrity. "He's wicked nice," Joey added. "Wicked?" Mulder laughed. "You're beginning to sound like New Englanders already." "You should watch Fritz Wetherbee's 'How to Speak N'Hampsha' special," Judith suggested, apparently deciding that Mulder approved of them sounding like state natives. "Yeah, maybe," Mulder said, looking deeply amused. We stayed for a while longer, mostly so that the boys could play with their classmates. I was careful not to let myself be cornered by the overzealous cub reporter, and actually found myself having a fairly decent time talking to Judith and the Blackwoods. Little Jacoby was fascinated by Autumn, and I made Aaron promise he'd send me the pictures he snapped of Jacoby goggling at her. Later on, after all three of our offspring were tucked into bed, Mulder asked for a debriefing. "So, what did you think of the people Judith introduced you to? You talked to them for quite a while." "In a way they reminded me of the gunmen," I quipped before describing them all to him. "So basically you spent the night meeting the sort of people my mother would have warned me to stay away from," Mulder said with a chuckle. "I suppose. So much for the whole staid New Englander stereotype." "Oh, I'm sure there are plenty of boring, straight-laced people in town. The real question is why Judith didn't introduce you to any of them." "Besides the Blackwoods, you mean." Leigh and Aaron were nice people, with perfectly ordinary lives. "Yes, besides them. They do seem like nice kids, though." I couldn't help but smirk at that, making him ask, "What?" "We're getting old, Mulder, if you're referring to people in their twenties as 'kids'." "I think I was born old, Scully." I thought back to the day I'd first met him. "Well, you are an old soul, that's for sure." "And this old soul is ready for bed," he told me, yawning. "Me-" I started to say, but was interrupted by a burst of noise over the baby monitor. "Oh well. Once more into the breech." It was pitch black as I raced down a hallway in what was supposed to be a completely abandoned mental hospital. Not screaming when things brushed against me in the dark was an effort, but logically I knew that it was just the detritus of hospital life scattered through the building. Despite tapping it, I couldn't get my flashlight to work, and while I could no longer see Mulder, I could hear him crashing into things in the distance. Somehow, despite all the noise Mulder was making, I could hear the tiny demon child we were trying to capture before it killed again. Being chased seemed to delight it, because it laughed in a sinister way that made all the hair on my arms stand up. A scream threatened to burst out of throat as I sat up and looked around. Apparently I hadn't actually made a sound because Mulder was still sleeping peacefully next to me. I was about to lie back down and try to forget about my nightmare when I heard a sound that made my heart hitch in my chest. Little feet running by my door. My heart began to beat normally again when I realized that it was just the kids. But when I looked at the clock, I noticed that it was three and began to worry. What were they doing out of bed at that time of the night? It didn't take long to shrug on my robe, but I was possessed by the silly fear that I'd open the door and see something other than my children. By the time I forced myself to open the door and go and investigate, William and Joey were leaving Autumn's room and heading my way again. They looked relieved when they saw me, which wasn't what I wanted. "Mommy!" William cried, worrying me more. Mommy wasn't something he said much any more. "What's the matter? And why were you in Autumn's room?" They glanced at each other with wide eyes, and Joey nodded. When he began to speak, I found myself wondering about twin telepathy for a second before dismissing the silly idea. "I woke up because I heard a baby screaming outside, and then I found out Will heard it too when I ran out to check on Autumn." "But, Mom, she's in her room sleeping," William added. "Of course she is. How would a month-old baby get out of her crib?" I asked, wondering if they'd both had nightmares too. "Dunno. But we still keep hearing it." "You hear screaming outside?" I asked, ready to dismiss the sound as the wind. But then I heard it too. Something was screaming outside. "See??" they cried, even wider-eyed than before. I pushed them down the hall, back towards the baby's room. Irrationally, I needed to see for myself that Autumn was still in her crib, safe and sound. She was, of course. "I want the two of you to stay in the house, okay? I'm going to go check things out." I almost told them to stay with their sister, but I didn't want to make them feel that threatened when there was probably no reason to worry that what was going on outside would endanger them. "Are you sure?" Joey asked worriedly. "We could go with you." "I'm sure. I think someone might need help, that's all." It took me a couple of minutes to get my coat and boots on. I felt stupid for putting them on over my pajamas but it didn't sound like the person outside could wait for me to get dressed properly. On the way out the door I reflexively grabbed a flashlight, and then stood there staring at it. The light flicked on immediately, making me feel foolish for the second time in as many minutes. The cold took my breath away as soon as I stepped outside. The pajama bottoms I was wearing were a thin cotton flannel, and the wind seemed to take getting through it as a personal challenge. I tried to ignore how chilled I felt as I stood in the yard, straining my ears to hear the cry for help. Thirty seconds later I was rewarded by hearing a cry that seemed to originate in the woods behind the house. Now that I could hear it clearly, it sounded more like a woman screaming in pain than a baby's cry. Racing behind the house, I called out, "Hello? Does anyone need help?" And the cry immediately cut off. Confused, I shambled to a stop. "Does anyone need help?" I asked again, louder, and the only sound I could hear was the rush of the river across the street. My heart beat harder as I tried to order my thoughts. Either there was someone in the woods behind my house who was trying not to be found despite being injured, or she was so badly injured that she couldn't cry out any longer. I didn't know which possibility was more upsetting. Grass crunched under large boots, so I turned, expecting to see Mulder standing behind me. I took a startled step back when I realized that I didn't know the man looking at me. When I pointed the flashlight at me he put up a hand to shield his eyes, which forced me to lower it. "It's not a person." "What?" I took stock of him as we spoke. He was about average height and build, with dark eyes and darker hair. I pegged his age around forty. "I was getting a glass of water when I saw you come out. I assume you did because you heard the screaming. It's not a person." "How do you know that?" I challenged. It certainly sounded like a person to me. "I've lived here forever, and I'm used to them by now." Childishly, I wanted to demand to know why I'd never seen him before if he'd lived in our town forever, but I didn't. Three a.m. was no time to get into avoidable confrontations. "What is it then?" "Fisher cat. The area's lousy with them. I hope you don't have any outdoor cats." "Good. They love killing cats and farm birds." He stuck his hand out. "Daniel Raymond. I take it that you bought the Webster place while I was helping my mother settle in Florida." I guess I now knew why the state hockey team was called the Fisher Cats. Apparently the vicious little things didn't hibernate. "Dana Scully," I said, warily allowing my hand to be shaken. "I guess we did." "Judith told me that you and your husband have twin boys and a baby girl," Daniel remarked. I tried not to sigh. "Of course she did." He grinned. "I've got two boys of my own, and they're pretty eager to meet your sons the next weekend I have them." A divorced father, I surmised. "That'll be nice." Deeper in the woods the cry sounded again. It still sounded eerily human, but I now detected a mindlessness to the cry that I hadn't before. I shivered, but didn't realize it until Daniel said, "I guess we better get inside before we freeze. I'd hope to come over and introduce myself later this week, but..." He shrugged. "You can introduce yourself to the rest of my family, if you like. Goodnight." "' night," he said, already turning back towards the house that had been dark since we moved in. It wasn't until right then that I saw that there were lights on at both the porch and the garage door. The fisher cried out once more for good measure, quickening my pace. I realized that they didn't attack humans, but I'd seen enough photos of them to never want to confront one in the dark. By the time I got to my front door I was yawning, and I promised myself to not let the biology lesson William and Joey would demand when I told them that the screams were made by an animal go on too long. Mulder and I took the kids grocery shopping one Sunday towards the end of January. Autumn was cranky, and I'm afraid that it led to us to letting our guard down, so before I quite knew it, the shopping cart seemed half full of sugary cereals, cookies, and other junk food that we usually didn't allow William and Joey to talk us into. Part of the problem was the Greek chorus of awws that Autumn inspired when other shoppers noticed her in the baby seat welded to the cart. It was nice to have my opinion of her adorableness confirmed by so many others, but I was surprised by the variety of admirers. William's colorless baby locks had drawn the eyes of moms, but even grandfatherly men stopped to tell us how cute Autumn was. It made me wonder how much attention Joey got as a toddler, once he finally had enough hair to tell its color. "Uh uh, no way," Mulder said, making me look up. We were halfway through our trek from one end of the store to the other. William had one of those frozen pans of blond brownies and Joey was clutching a tube of sugar cookie dough. This didn't sway Mulder. "There may be a new baby in the house but that doesn't mean that we are going to let everything slide. You don't want to be part of the childhood obesity statistics, do you?" "But-" they began to protest. "Go put those back where you found them. Any more arguing, and we'll start putting this other stuff back too." Instead of saying anything more in their defense they gave him hurt looks, and began to trudge back to where they found those things. As soon as they were gone Mulder gave me a tentative smile. "That wasn't unduly harsh was it?" I shook my head. "Things were getting out of hand." We both looked at the items we'd let them talk us into. When had I said yes to fun size candy bars? A dimly recalled "okay, sure" floated through my brain. "If one of us didn't put our foot down, it'd never stop." He still looked guilty. "I just remember how devastating being told 'no' felt at their age. It was hard understand that parents set limits because they care about your well-being, not because they're just trying to be mean." "Kids aren't able to think that way very well. The type of abstract thinking that requires doesn't start until age eleven or twelve." To my surprise, Mulder gave a sharp bark of bitter laughter. "You know, I was twelve when I figured it out. After Samantha disappeared, they never said no to me again. A younger kid might've considered it a boon, but I was just barely old enough to understand that they just didn't have the energy to care anymore." I squeezed his arm, but didn't say anything. Because, really, what was there to say to that? We were still waiting for the kids to come back when I spotted a familiar face at the other end of the dairy aisle. "Oh no, hide me," I hissed as I tried to get behind him. Mulder followed my gaze before giving me a puzzled look. "Isn't that one of the people you talked to at the New Years thing?" "Yes." I peeked around his back, hoping that I hadn't been spotted. "I thought you liked them," Mulder continued. "You spoke to them for quite a while. And you compare them to the gunmen. I thought you liked the gunmen..."
"I did like the gunmen," I reassured him. "The people from the party are fine. I just don't want him to see me and bring up-" Max's eyes lit up when he noticed me. "Crap." I'd accidentally made eye contact, so there was no way that I could plausibly pretend to desperately need apples or something down in the produce section. So, all I could do as the young reporter practically sprinted over was to grit my teeth and plaster on a pleasant expression. "Ms. Scully!" Max called breathlessly, seeming to realize that seeing him had triggered my fight or flight instinct in a big way. "I was hoping to run into you soon." "Oh. Hi," I said weakly. "Why's that?" "I wanted to let you know that I shared my idea with the chief, and he loved it. I have the go-ahead to arrange a state whenever you and your friend are available to stay at the inn." "You and what friend are staying at an inn?" When he smiled the corners of his eyes crinkled, and I knew exactly what he was thinking. Max had no idea that someone overhearing would naturally assumed that he was trying to help me plan an extramarital affair. Fortunately, Mulder's suspicious nature didn't extend to any doubts about my commitment to him and our wedding vows. "The one who lost a little boy," Max volunteered. "I'm sorry, I didn't get his name." Mulder looked down at me. "Why would you and John be staying in an inn?" "As a favor to me," Max said quickly. I think he'd finally realized how what he'd said might sound. "A huge favor. I'm a reporter and I had a great idea for a story, something with more teeth than I'm usually stuck writing..." Max quickly and enthusiastically explained the whole thing to Mulder. "... And Dana was kind enough to both volunteered to be my skeptic and suggest a control person too," he concluded. I thought about protesting that I hadn't volunteered, but I decided that it would be a wasted effort. Apparently failing to run away screaming was as good as agreement as far as the young reporter was concerned. Max looked at me expectantly. "Oh. Um. I'll have to think of a reason that I'd be staying at the inn too, not just John and his girlfriend." I hated calling a woman over 40 someone's girlfriend, but it seemed a little much to suggest that they married to save me the use of an awkward label. Max nodded and pulled a small notepad out of his back pocket muttering "one room double occupancy." He flipped to another page and scribbled something on it before tearing it out and handing it to me. "When you get a date arranged, give me a call and I'll set everything up at the inn." "Right." I fought the impulse to crumple up the slip of paper and drop it on the floor. "Great!" Max said happily before wandering towards a small freestanding case of frozen pizzas. I sighed before I noticed Mulder looking at me. "I think I see now why they remind you of the gunmen." The rest of our shopping trip was fairly uneventful. "So, any idea why I'd be staying in an inn, in the town we live in, without you?" I asked as Mulder help me change out the bedding for the new flannel sheet set I'd insisted upon buying when I realized how much colder January in New Hampshire was than in Virginia. Mulder tucked in the sheet's bottom corners on his side before answering. "You're eager to do it? I got the impression that you didn't volunteer so much as have your arm twisted into agreeing." "So... you're not going to put it off for a long as possible?" "If I thought that putting off would mean that he'd forget about it, I would." I shrugged my pillow into its new case. "But he's not the type to be put off that way. If I don't want to spend every trip into town looking over my shoulder, hoping to avoid him, I'd be better off getting this over with as soon as possible." "Ah, I see." He didn't say anything for a while, but I could tell that he was giving the matter's thought. "I've got it." "You do?" I asked uncertainly, wondering what "it" was. I just hoped it didn't involve terrorizing Max. He was annoyingly persistent, but really, he was just trying to do his job. "I do. To make nice with our new neighbors we entered a Yankee swap at the town's Christmas party-"
"But we didn't even go to the party." I'm sure if we hadn't come home with Autumn less than a week before the party, Judith would have been after us to go to that one too. He ignored my objection. "-And ended up with a gift certificate for two rooms at the inn some weekend. We were going to let it go to waste, but I suggested that you could use a good night's sleep, and it be nice if John and Monica could come to visit then to since the gift certificate requires that both rooms be booked at once." "That could work," I admitted. "If you say the part about you getting a good night's sleep it will definitely work. They'd feel guilty about costing you that, so they'll agree." I came around to his side of the bed and wrapped my arms around him. "Mulder, when people tell you to only use your powers for good, not evil, don't listen to them. I love you just the way you are." He kissed the top of my head. "You say the sweetest things, Scully." My hand hadn't quite reach my phone when William asked, "who are you calling, Mom?" "Dad and I thought it might be nice if we asked John and Monica to come up for a visit." "Oh!" His eyes lit up. He and Joey were quite fond of John. "'cause they haven't seen the house or the baby yet?" "That's right." That's part of it, I amended silently. "Cool. Can you tell John that me n Joey want a rematch for the racing game he gave us?" "Joey and I. And I think that I'll let you tell him yourself, if they come." "Okay. I guess we don't want to warn him after all." "Why not?" I asked, dying to know the reasoning behind that. "So's he won't practice before he gets here," William explained. Oh, to be eight and a half again, I thought while trying hard not to smile. Kid logic is awesome. "That's a good reason. Can I call them now?" "Whoops. I'll go help Joey with his construction project." "Wait. Construction project?" I asked a little sharply, a little worried that they were getting into Mulder's tools. "When he went to Home Depot Dad got us a kit to make birdfeeders. Joey wants to make his now so the paint is dry for sure before the birds come back," William explained. "I'm gonna wait a little while 'cause I want to modify mine some so I need to work out a design." "Oh, that's nice." I didn't have the heart to point out that it would be another three months before any birds who weren't already around came back, so neither of them needed to rush. But I was impressed that he'd used modify correctly. Mulder had started giving the boys a new word each day to learn, and I seemed to recall that modify had been an August word. "I know, right?" he said before running off. John picked up on the first ring." Dana?" he asked, reminding me that he had caller ID. "What's up?" "Mulder and I were wondering if you and Monica had a free weekend sometime soon. We'd love to see you both. The boys are eager to play tour guide here." "Sure. I'm gonna put you on speaker phone-"
There was a moment of rustling before heard Monica's voice. "A visit sounds great. I'm dying to hold that baby of yours," she said warmly. "We didn't think that you had a guest room, though." "Actually we don't..." I began feeding them the story that Mulder concocted, making sure to mention a good night's sleep. "That sounds nice. We'd love to," Monica said, sounding sincere. Hook, line, sinker. "So the gift certificate is good for the next four weekends. When is good for you?" "Next weekend?" she asked, clearly speaking to John. "Next weekend would be best," he told me. "Great. I'll let the inn know tomorrow so check in has no complications." "Okay. We'll see you then. Bye." I was still holding the phone when a voice behind me asked, "The story worked?" He was holding Autumn, and I tickled her before replying. "Yes. They fell for it." It was then that I realized he'd only entered the kitchen early enough to hear our goodbyes. "Next weekend. You're sure that you're okay with me being gone over night?" "It will be fine," he said confidently, and it left me feeling reassured the way faults bravo or nervousness wouldn't have. "I guess I better call Max," I said reluctantly. Dealing with his enthusiasm two days in a row felt like a little much. Mulder grinned. "I've heard you sound happier about planning to visit an inmate on death row," he teased me. How many other husbands could say that and be speaking literally, I idly wondered. I'd had a hope that the number Max had given me would be a direct line, but a curt female voice answering, "Ballyguest Gazette, how may I direct your call?" put an end to that. "Could I speak to Max Kirby, please? He's a reporter," I added once I remembered that she might have a ton of people to direct calls for. "Hello?" Max's voice sounded wary, and it was very clear to me that not too many people found reasons to contact him at work. "Oh, how are you?" From his tone he probably thought I was calling to back out. "Good...I hope this coming weekend works for you. My friends agreed to come up then." "That'll be great." His voice now held more enthusiasm than confusion. "I'll set everything up with the inn. They already know about the story, and they're happy about it, so I expect everything to go very smoothly." "I'm happy to help," I fibbed, "but how do you expect this to go?" I gave an exasperated wave of my hands before realizing that he couldn't see me. "How do you expect to keep this a secret from John so you can get anything useful from him?" "Oh, that. Actually, I'm going to go undercover a bit." "As?" I asked. The thought of him sticking on a fake mustache and pretending to be a waiter bubbled up in the back of my mind, almost making me laugh out loud. "I'm not sure you understand what undercover means-"
"- a reporter doing a fluff piece on dreams, and what they mean. You know, human interest, maybe some humor, that." I found myself nodding. That was actually a pretty good story. A low-readership local paper probably did do that sort of piece now and again. "But what if he doesn't want to participate?" "I can be very persuasive." Well, he had me there. "It might be best if you tell him that you got talked into participating in the story, and were hoping that he wouldn't be too upset about it." Getting roped into something by Max? That I could sell. "Okay. And how are you going to keep him from finding out why other people come to Memory House?" "I was hoping that you could keep him occupied. I've arranged for an activity that only the three of you will be invited to, not the other guests, so that should suffice before he gets to bed that night." "Thanks for doing this, Dana. It means a lot to me," Max said, taking me aback a little, "career-wise." When I hung up, I found myself rooting for him a little. Until he mentioned its importance to his career, I hadn't really given it much serious thought, mentally comparing its importance to that of a kid trying to get the scoop for the school paper. His statement reminded me that he was an actual professional, not a kid. It was hard to feel trapped in a role you didn't like, and now I felt a little responsible for helping him escape it for a better one. Damn. Just after John and Monica called to let us know that they'd reached the New Hampshire state line, Mulder got a funny look on his face. "What are you thinking about?" I asked, already beginning to feel a little nervous. That expression on his face was never a good sign. "I just realized that there's a weak link in our otherwise flawless plan," he muttered. "Make that two weak links. William? Joey?" he called before looking back at me. "We need to have a quick conversation before the gig is up." The boys skittered into the living room a moment later, both giving their father expectant looks. Mulder patted the couch cushions on either side of him. "Have a seat." "Are we in trouble?" Joey asked anxiously. Inside I cringed at the memory of hearing that question as a child - it was always followed by the captain sternly asking "I don't know. Are you in trouble?" I vowed never to ask my children that, and so far I've managed not to break this vow. "No, not at all. We just need to have a quick chat before John and Monica get here." He thought for a moment before asking, "Do either of you know what a double blind study is?" Joey gave him a blank look, and William looked faintly horrified. "They do experiments on blind people? That's so mean." "Uh, no." Mulder cast me a helpless look, and I shrugged. He did his best to forge on. "The 'blind' part just means not knowing." "Oh." It was blindingly obvious that they found his explanation less than illuminating. "Actually, this has less to do with a double blind study than one with a control anyway-"
William interrupted him to ask, "To turn it on and off?" I decided to help once I realized where Mulder was floundering to. "You know how people go undercover sometimes, so they can find stuff out that they couldn't otherwise?" They nodded. "Like on TV." "And you did that sometimes too, right?" Joey asked. Mulder flashed me a grateful smile. "We did, sometimes. And this weekend Mom sort of is going to do that again too. But not for the police or the FBI." "To help a reporter who is writing an article. To make the article scientific, he needs someone who doesn't know what's going on. That someone is John." "It is?" The boys were beginning to become confused again. "Right. John can't know that there is going to be an article, one the article won't work right. So we told him and Monica a 'cover story.'" Mulder cringed. I didn't blame him. "Well, sort of, but not exactly. It's okay to give a cover story for an undercover assignment, even though that lying is usually wrong." I waited for one of them to ask the moral difference, but they seem to accept his statement at face value... much to his relief. "So, Mom's cover story is that she went to a Christmas party and won a gift certificate to the inn-"
"But she didn't go to a Christmas party. None of us did. You said 'next year' when we asked which is okay, and-" William began to ramble until his father cut him off. "I know we didn't go. That's why it's a cover story," Mulder said patiently. "There are two important things we need you to do in order to make the cover story worked. Can you guess what they are?" "That's okay. The first thing you need to do is remember not to correct them if they say something about the pretend party, or the gift certificate. Got it?" "Good. The second thing is harder. You can't help make the story more believable, like talking about things that happened at the imaginary party. Sometimes it feels like making up details will make the story feel more real, but it usually makes the listener suspicious instead. So if they say 'you and your parents went to a party, huh?' You just say 'yup' rather than pretending to have done something there. I know that it can be hard to resist the temptation to make stuff up, but I also know that you can do it." "We can," William said firmly. "You can't tell them after either," Mulder added. "Mom will tell them when the article is published." I would? I thought before realizing that I probably would have to it... assuming that the story ever did get published. Mulder beamed at the boys. "I knew we could count on you both." "Are your rooms ready for guests to see?" I asked, looking at William as I spoke. Joey was always tidy, but William was a different story. I looked at my watch. "You probably have half an hour before anyone sees it, so up you go." Instead of leaving the room as expected, William turned to Joey. "I'll empty the dishwasher all week if you help me." Joey considered this for a moment. "Deal." I wasn't surprised, because Joey hated emptying the dishwasher more than any other chore, and apparently didn't think neatening a room was a big deal. "That was nicely done," I told Mulder as soon as they cleared out. "Instead of them blabbing and accidentally ruining things, you've made them proud to be included and trusted with a secret." "I try," he said modestly. "But a double-blind study, Mulder? What eight-year-olds know about scientific studies?" I teased him. The door to the nursery was cracked open a bit, so I could hear when our guests arrived in a rush of happy voices I couldn't fully make out. Unfortunately I was still nursing Autumn at the time. "Hey, you decent?" Mulder called a couple of minutes later as he walked towards the baby's room. I'd just started the process of buttoning my shirt at the time. He grinned as he came in the room. "John and Monica have excellent timing as usual." I smirked at him before handing him Autumn so he could burp her while I finished making myself presentable. "If they had busted into the room two minutes ago, it's not as though Monica hasn't seen more of me." For a second he looked nonplused, but the confusion passed quickly. "Oh, when William was born." "Yes... what was your first thought?" I asked archly. "Something out of a penthouse forum letter? I was lonely when you were gone, but not that lonely." He waved a hand dismissively. "It would have been an eyeful for John, anyway." I noticed that he gave me a sidelong look, and I wondered if he thought there was a more than 0.01% chance that he was wrong. What did he think, Doggett teleported to Georgia to see me give birth? That he'd accidentally walked in on me changing while away for a case? That we'd gone to Marti Gras and I'd flashed the crowd for beads? Deciding not to torture his imagination any further, I agreed with him. "That's true." Mulder tossed the burping cloth into the hamper, and held the door for me. "We better go rescue them from the boys. Their tour has been pretty...boisterous." I laughed and followed him down the hall. After a round of hugs from Monica and howyabeens from John, Autumn settled into her starring role. They say that you can't spoil a baby less than six months old, but sometimes they got so much attention - and nice swag - you had to wonder. Monica bought her a pink teddy bear, and I accepted it gracefully, though privately I've doubted her taste since she revealed a fondness for whale songs, so I had practice. "What a little beauty. Dana, she looks so much like you." I had expected Monica to be the one who was more interested in the baby, but to my surprise it was John who was really taken with her. It shouldn't have been such a shock, but I'd always assumed that they hadn't married or had a child because he didn't want to. Maybe that wasn't the case after all. John was holding the baby, giving her adoring looks. He glanced up at me. "She's going to break hearts one of these days." "Probably not," he agreed. "With you two as her parents, how manipulative could she possibly grow up to be?" "Uh, John?" Monica interrupted, holding out her arms. "Stop hogging the baby." "Finally!" William exclaimed the moment that John's arms were empty. "Can we play a game of NASCAR 09 before you leave for the inn?" Joey gave him a pleading look too. "Please?" John gave me a look and snorted. "I take it back all. Sure, let's play a round now." The tires of my car crunched as I parked in the lot a few hundred yards from where Memory House stood. It was clear that someone had made an effort to plow, but there was a thin glaze of snow in all the parking lots I encountered lately, and natives grimly informed me that it was just a wintry portend of things yet to come. So far winter hadn't been bad, but I'd looked up the snowfall totals for the three previous winters, and that explained why people seemed so sure it was only a matter of time until the other shoe dropped: there had been a recent winter with more than twice the average annual snowfall, and another that came close to matching it. John rubbed his arms when he got out of his car, making me recall that he'd grown up in Georgia. After all the winters he'd spent in New York, I was still a little surprised that he was still so deeply affected by the cold, but he told me that he'd known some southerners who were still unable to cope even after decades in the north. "Come in out of the cold," a voice called cheerfully from the doorway. I hadn't noticed that there was anyone there until she called. Glancing over at her I saw that it was a stout woman with short gray hair and a friendly expression on her face. Monica took one of John's arms, and the three of us made our way over to her. She smiled even more warmly when we stepped inside. "Welcome to Memory House, I'm Vickie, the innkeeper." "Thanks," I said, wondering how to check in. I should have asked Max, but it didn't occur to me that there might not be a desk immediately visible. Even Duke Crocker's hotel had one. None was in the foyer of Memory House, though, just a huge fireplace that John immediately went to stand by. Monica went with him, leaving me alone to deal with getting our rooms. "I have your keys, Ms. Scully," Vickie said, handing me a pair of literal keys. No passcards in Memory House, apparently. I finally noticed a desk and key rack in an alcove around a corner. She took two steps to close the gap between us, and glanced over at the crackling fire. "I've spoken to Max so..."
I smiled. "And I bet you're feeling the sting of remorse already." Her low laugh reminded me of my aunt Olive's. "I'm not sure if we'll be better or worse off in this town if that boy manages to get the success he's driven to try for. At any rate, he left this for you." She handed me a piece of cardstock. An itinerary was printed on it. Still smiling she looked over to where John and Monica were warming their hands. For some reason I wished that I'd brought a bag of marshmallows and a novel I could curl up with on one of the couches next to that inviting fire. "If you like, I'll show you your rooms now." It was clear that they were reluctant to leave the fire, but they didn't protest. Instead of making us climb a staircase or two like I imagined, Vickie lead us down a short ground-floor corridor. "We only have a few rooms down on this level," she said, giving me a pointed look. "So you shouldn't expect to hear much noise from the other guests, or need to worry about disturbing them by coming and going yourselves." I glanced at Vickie, and felt a pang of sympathy. Clearly I wasn't the only one Max had managed to get to go out of their way for him. It gave me an inkling about why people were so hard on him about breaking up with the boss's daughter: I could readily imagine a nice young woman in her twenties being conned into doing things for him right up until the day he broke up with her. "That's great," John said, startling me. I was so deeply into my imagination that I'd nearly forgotten that they were there. "Especially if we go out later," I said, thinking of item number three on Max's suggestion list. After I used my key to open the door, I took a look around the room. It matched my mental picture of a small town New England inn almost exactly. The walls were painted colonial blue, and the crown molding and chair rail were white. All of the furniture, including the bed frame, was made of wood painted white as well. On the bed there was a plaid quilt, unsurprisingly also primarily blue and white. I was half surprised not to find nautical-themed items in the room, perhaps a tasteful silver lobster. I dropped my overnight bag onto the bed, and sighed. It was quite clear that the room was supposed to evoke Cape Cod, not that we were within hours of it. Given how clich�d I thought the room was, I was surprised to hear the door open behind me, and Monica say, "Dana, can you believe how cute these rooms are?" Doing my best to hide my disbelief, I said, "No, I really can't." "I've always loved this color scheme, and tried to convince John to like it too, but he said that he likes our place the way it is now. You know how he is, not someone who loves change." I grinned at her. "He does change. Didn't you tell me that just this year you'd got him to forgo putting his NASCAR-themed Christmas ornaments on the tree?" "Only because I bought him a miniature Christmas tree for his study to put them on instead." "Oh." The thought of John having a small tree hanging out near his computer struck me as amusing, but I killed the smile. "But you have to admire a man who knows what he likes," she concluded wistfully. You did at that. Somehow I got the feeling that she felt lucky to be included among what he likes. I wouldn't tell her, but I never was able to decide who got the better end of their match. I guessed that meant that I figured that they were both equally lucky to have found each other. John figured out where she went a moment later and stuck his head into my room. "Oh, there you two are." "Now that we've finished playing hide and go seek, I have some news," I said briskly. They both gave me expect looks. "I found out that not only did we get a night's accommodation, but after dinner we also have tickets waiting for us for a local play, won't that be fun?" I said, hoping that I sounded more enthusiastic than I felt. Fortunately, Monica had enthusiasm enough for all of us. "Wow, really? I haven't been to the theater forever." "I hope you're not expecting too much," I cautioned. "It is after all a local theater group. Not Broadway or anything." She snorted. "Oh, you don't think I'm some sort of theater snob, do you? Half the plays I've seen have been peopled with students. Professionals at all have to be a step up from some kid participating to either look good on a college application, or get credit for a theater class." "What's the play?" John asked. "All My Sons," I said, recalling what the itinerary said. "It is a play by Arthur Miller." "That's one of his earlier, lesser known ones," Monica said authoritatively. "Most people don't realize that he had a lot of plays besides The Crucible, Death of a Salesman, and A View from the Bridge." "Well, what's this one about?" John asked. "I take it that there is no witch burning in the play we're going to see tonight." She smiled fondly at him, and then explained the basic plot of the play. I don't know what John thought, but it sounded less than riveting to me. I looked at my watch. We had just enough time to go to dinner before we had to be at the theater. Dinner took us longer than I ever would have anticipated, mostly because our waiter was brand new. He was quite clearly trying to do everything right, but that meant he moved at a snail's pace. I tried very hard not to be impatient with him because we've all been new once, but I wasn't sure how I was going to keep John and Monica occupied if we happened to miss the play. I supposed that going in late was an option, but people are usually reluctant to see something they'd missed the beginning of. Not to mention how unhappy theater patrons tend to be with late arrivals who open the doors and flood the room with light before stumbling over them as they hunt for their seats. The tickets were still waiting for at us at the box office as promised, even though we got there within ten minutes of the start time. I took them after giving the man behind the counter a grateful look when he didn't say anything to give the heist away. Maybe he didn't even know anything about why we were there. It was beginning to bother me how concerned I'd become that someone was going to spoil Max's story. Part of it was that I was fairly certain that if he didn't get this story out of me, he'd want another. At least this one was harmless enough. Oddly, it was John who seemed the most eager for the play to begin. He took Monica and I both by the arms, saying, "Come on, we need to find our seats." "John, are you actually looking forward to this?" Monica teased. She continued to tease him, but I appreciated learning something new about my friend. Until then, I had no idea that John was interested in watching anything that didn't involve a baseball or racecar. We found our seats only seconds before the lights dimmed. Even those seconds, however, I spotted Max. Somehow, I had had believed that I wouldn't be seeing him until the next day, but clearly I was wrong. I sat back in the above red velvety chair, and immersed myself in the play. It turned out to be a lot more interesting than Monica's description gave it credit for. I really felt for the family in the story, though I thought that the father displayed the same sort of weakness that had plagued the main character in Miller's more famous Death of a Salesman. It made me wonder what it was about Miller that had him repeatedly writing about weak patriarchs. It could have been worse, I decided, he could be obsessed with hookers and bears instead. John and Monica seemed to enjoy the play immensely as well. For once, I found myself glad that Mulder wasn't with me, because he wouldn't have enjoyed the play. Instead he would have been making fun of it by the time the curtain closed. The only play I had ever gotten Mulder to ever agree to go see with me was a Christmas Carol, and it was quite obvious why he enjoyed that one. Perhaps he would have enjoyed this play if there had been a few ghosts of the literal kind too. After an appreciative smattering of applause and a curtain call, the lights in the theater slowly came back up. Someone in the crowd behind us was explaining that the sort of theater we were in was called a black box theater, and how there weren't many of them in New Hampshire. Eventually his voice drifted away and we too began to ready ourselves to leave. "That was a nice play," John said as he stood. "I liked it too," Monica added, putting on her coat. "Oh, uh..." I trailed off, spotting Max off in the distance. He caught my eye, and I realized that his presence had meant that he'd intended to come over to see us, not just to make sure that we had gotten there. "There's something I better tell you. I hope you won't be mad at me," I quickly told John and Monica. "What?" John asked, a hint of suspicion in his eyes. "It's nothing terrible, it's just...I found out that a young reporter I know is going to be conducting interviews with guests at the inn this weekend. Tomorrow morning, actually." "What sort of interviews?" For her part Monica looked interested, not suspicious. "Well... he's asking people to tell them what they dreamed about tonight." "We did that in my dorm during college," she replied, not surprising me in the least. "We all kept dream journals for an entire semester and looked up the meanings." "Dreams don't mean anything, they're just your synapses firing at random," John scoffed, and I found it hard to agree with him. I don't think that dreams have any secret meanings, but they're not completely random. If it were random, we wouldn't dream about things that worried or excited us the way we do. "Regardless," I said. "I said that we'd tell him our dreams, if we could remember anything, tomorrow morning." "All right," John said, surprising me with his easy agreement considering he'd just dismissed dreams so harshly. "Really?" Monica asked. Apparently I wasn't the only one to think his agreement was unexpected. "I said they didn't mean anything, not that I thought they were dangerous. If people want to waste their time trying to find meaning in them, they can knock themselves out." "Oh. I don't mind either, Dana." "Good." No sooner was the word out of my mouth did Max head our way, weaving in and out around people filing out of the theater. He reminded me of a salmon trying to swim upstream. "Hi, I'm Max." The young reporter stuck out his hand and John and Monica each shook it. "I hope that Dana has told you about the article I'm writing." "Sure did," I replied, trying to sound natural. "We're both happy to help you with your story. I have always been fascinated by dreams, and what people think they mean." Monica looked very earnest as she spoke, and I wondered what sort of impression she was making on Max. John, on the other hand, didn't bother to hide his skepticism. "I usually remember my dreams. Hopefully I will tomorrow so you get something useful." From the look that Max gave him, it was clear that the reporter read between the lines and understood that he was being humored. "Well, thank you both very much. Oh, and you too of course, Dana. Do you have any idea what time you think you'll wake up?" John spoke up for us all. "Probably around eight." "That's great. If I come by at 8:30, that should give you enough time to get dressed, yes?" We all agreed that it would. "I'd like to ask that you either spend time in the morning thinking deeply about your dreams, or use the notepads that I know the inn's proprietor leaves in the desks to take a few notes to remind yourself. That way the dreams will still be fresh in your mind when I talk to you. I know it sounds silly, but dreams have a way of rapidly leaving our brains." Max looked little bit apologetic, and I was certain that he was thinking of something along the lines of his having given us a homework assignment. Monica seemed to agree with him. "It's true. I don't how many mornings I've woken up, gotten distracted by the alarm or something, and a half hour later have no idea what on earth I dreamed about." I couldn't disagree. All my life my alarm clock had served to murder my dreams if I slept all the way until it went off. Things had gotten even worse since having children because they had the same ability to immediately steal focus from everything else. Until my reoccurring nightmare, it had been weeks since I had any dreams I could clearly recall. "Great. I am really glad to meet you both, and eager to talk to you tomorrow morning. I hope you have a wonderful remainder of your evening." Just then, John yawned. "I don't think there's very much of it left for me, but thank you. It was nice to meet you too." "Yes, it was nice to meet you. See you tomorrow morning," Monica said brightly. Max wandered off, leaving us to watch him go. Monica put her hand on my shoulder and squeezed briefly. "When you and Mulder said that you were moving all the way up here, I wasn't sure what to make of it. People say that New Englanders are standoffish, but you seem to have moved to a town with friendly people. I'm glad for you." I wondered what my expression was. At times, I wouldn't have minded living amongst stereotypical closed-mouth yankees, but at others I was glad that there were people who were trying to make my family feel welcome. The mix of feelings were at odds with each other, and I am positive it showed on my face. But neither Monica nor John made an issue of it. "So, maybe a nightcap and then we try to get some sleep?" I asked, thinking about how glasses of wine had been on the room service list. It still struck me as funny that such a tiny inn offered room service at all, but I supposed they had to in order to compete. "Or maybe just getting some sleep," John suggested instead. "Okay. Alcohol's overrated anyway." I fished in my pockets and came up with my car keys. The play had been more popular than I would have credited a local production with, so I was glad that I drove and we hadn't had to find a second parking space. We talked about the play the entire way back to Memory House. As long as we could sneak in without running in to any other guests, Max was golden. His plan seemed to be working out far better than I would have guessed. All three of us were yawning by the time we reached the hallway with our rooms. "Hey, I'm going to take a shower," John said, kissing Monica on the cheek. "See you soon." Monica and I stood there for a moment, neither of us saying anything. All of the sudden, now that I was about to sleep in a strange bed, I wanted to be at home, Max's story be damned. "Are you okay?" Monica asked, giving me a concerned look. I gave her a small smile. "I'm okay." "It must be hard being away from the baby," she offered. It wasn't just Autumn. I missed Mulder, and I missed Joey and William too. One of the luxuries of no longer being an FBI agent was that there were very few nights these past several years when I had not been able to tuck in first William, and then Joey, and now Autumn. There had of course been a few nights at the hospital when cases had gotten so critical that I had to pull late nights, but those nights had been few and far between. Being away from the kids now reminded me of what it had been like when the boys had been infants, and I had had to leave one or the other with my mom. And she had been good about being willing to take care of Joey during cases those three months before I had given him up too; it hadn't really bothered her that he wasn't - or so we then believed - her grandson like nearly everyone else thought. Sometimes, caught in a flight of fancy, I thought of that and wondered if perhaps she had been so good with him because she had the sort of premonitions that Missy always insisted ran in our family. If she did, and it was unlikely, it would make sense that she'd been so willing to help even if she didn't know why. "Yes. I miss her. I miss them all," I admitted at last. I did not say that I was suddenly missing my sister as well, because I figured it would be too much of a non sequitur for that hour of the night. Monica drew me into a hug, which made me miss Missy all the more. "If you decide that you need to go home tonight, to just check in or whatever, I won't tell John." "Thank you. I won't lie and say that the thought didn't cross my mind, but I think I'll be okay. I'm just going to call home and say goodnight." She let me go. "You know, sometimes I envy you," Monica startled me by saying. Her shoulders rose and fell in a shrug. "You're a good mom. I am not sure that I will ever be a mother of any sort, never mind a good one." My first inappropriate thought was a burning desire to ask what sort of woman had raised her. I knew very little about Monica's adoptive parents, and had never quite gotten a sense of how she felt about them. I did know that she had only gone to Mexico to see them a handful of times since I met her, which suggested to me that she wasn't especially close to them. That was sad, but I realized from Joey's fond memories of his other mom and dad during the first few years of his life, that it wasn't necessarily par for the course. He had been quite happy until his parents had panicked when his IQ test results came back, and decided to send him to boarding school to get a good education. I'd grown to realize that they had just been trying to do their best by him, so I no longer was mad that they sent a five-year-old away, though it was obvious at times that he still was. "Why not?" I asked instead. "Unless you don't want to talk about it..."
"Fear, mostly," she admitted, and I wondered if she meant her own, or John's. "I've just never been sure that I'd make a very good role model for a child." I gave her a look of disbelief. "Really?" "What do you mean, 'really'?" she asked suspiciously. "Do you actually think I'd let you be around my kids if I thought you were a poor role model?" She gave me a crooked smile. "Considering how much time William spent around the gunmen as a baby, I sort of doubt your judgment there." I knew she had been kidding, but I still found myself rising to defend them. "They had been admittedly odd, but they were good men. If they were still with us, I'd be as happy to have Joey and William look up to them, the way they do you and John now." "Thank you." Monica sighed. "I'll try to keep that in mind the next time John drops hints about looking into adoption." Hints? Then it hit me: John's fuss over Autumn that afternoon had been a performance of his own. I almost asked her why adoption, but before I opened my mouth and made a fool of myself I considered her age, which I hadn't before because she's a little younger than I am. There were very few pluses to having been abducted, tortured and experimented upon when I was young, but the beneficiary of them was at home in her crib. The door to their room creaked open. "Monica?" John, hair still soaked, looked out at us. "Coming, hon," she said before glancing at me. "Sweet dreams, Dana." I went into my room shaking my head. She had no idea that we were the only three people in the entire inn who weren't desperately hoping for just that. Before I did anything else, I called home. The kids would no doubt be asleep, but at least I could check in with Mulder to see how the day went. When I dialed the phone, Mulder wasn't the one to pick up. "Mom!" "Hey, sweetie, what are you still doing up?" It was already after ten-thirty. "Dad said that you were gonna call, so me and Joey could stay up until you did. Or until eleven-thirty." "Eleven-thirty?" I asked, wondering about the sanity of that. I could only trust that Mulder knew what he was doing, and hope that the boys would never tell my mother or I'd never hear the end of it. She'd assigned us ten p.m. weekend bedtimes until we were in high school. "Mom," William said, sounding exasperated. "It's Saturday." "I guess the occasional late Saturday is okay." "Wicked good. Dad took us to the Lowes in Greenland so we could buy stuff to make shelves in the basement for our Lego stuff. And he's even going to let us help him make 'em," William concluded proudly. I stared at the phone, wondering what had come over him. Until this month he'd shown no interest in constructing anything much, but this was the second time he'd been excited about carpentry projects. "You like building stuff, huh?" I asked, then remembering him being two years old and carefully building towers with blocks. When he was four he ruined the set by finding a bottle of glue and gluing the pieces together. Maybe I just hadn't been paying enough attention. That mention seemed like a good segue. "Hey, is your brother around? I want to talk to him too." "Wait, a second. Good night and I love you, Will." Sounds became muffled, so I knew he'd lain the phone aside. It was picked up a minute later. "Hi, Mom." "Joey, did you have a good day too?" I asked, picturing him on the other end. William had probably been bouncing from foot to foot as he spoke to me, but Joey was always calmer. Even after more than two and a half years, it still surprised me that he was so much more serious than his brother. "Yup. We're going to make these neat shelves to display our Lego stuff. I feel kind of bad for Dad, though." "First Autumn had a diaper that got..." he paused, trying to think of a good word, "...gross. Like runny. So Dad had to change her before we went out. Then we went out, and came home. And after she ate, she threw up all over him, and her, so he had to change her and his shirt." "That doesn't sound like any fun." "Yeah, but he acted like it was no big deal," Joey told me, sounding impressed. I wondered why until he added, "Right after we got Ava and I was home for Christmas break, my other dad had take care of her, and he was real nervous. And Ava wasn't even a brand new baby like Autumn. And he didn't have to change her over and over either." A warm feeling began to spread through my chest. Somehow, I thought that Joey's worries about the baby were beginning to taper off now that he realized that not all fathers were like Jonathan. When the first person you called 'Dad' landed in jail for criminal neglect, it had to be hard not to generalize. "I don't know what to tell you, kiddo. Your father has always been a competent guy." "With babies and monsters both," Joey exclaimed. "I don't know, did Batman ever look after a baby?" I asked, beginning to laugh. "Well, Robin could be a big baby sometimes." "I love you, but I think I'd better let you go and talk to Dad, okay?" Mulder's voice reached me a minute later. "How's the secret mission going?" "So far so good. They're in bed and no one managed to corner us and tell us about the inn's reputation. Before we got here I was worried that there'd be a plaque or something, but it's not that corny." "Good to hear," I could sense amusement in his voice, and I guessed that he was picturing guests being greeted with a plaque or a heart-felt and absurd story about the wonders of the place too. Of course, the inn's staff knew about Max's article and they had to hope it would be good for business, so maybe our check in hadn't been typical. "So I hear you're going to be doing a lot of laundry," I said. He groaned. "Which one of them told you about the blow out diaper and our daughter's attempt to reenact that scene from The Exorcist?" "Joey. You impressed him, Mulder." "He compared you to Batman." "I think it's a high compliment from an eight-year-old. Things going otherwise, bodily fluids not withstanding?" "Pretty good. How about you? Suffering from baby withdrawal yet?" "Definitely. I'm coping, though. I'll be glad to be home tomorrow." "I'll be glad to have you back, too. Which isn't at all a hint that I can't handle things, but everything is better with you." "Mulder..." How could he still say such sweet things that made my heart ache so pleasantly after so very long? "Love you." "Love you too. Try to get some sleep, huh?" "I will." I paused. "Did you check the baby monitor batteries?" "Sure did. Good night, my love." After I hung up the phone and spent some time feeling like I was a denizen of a dairy farm, I slipped under the covers and hoped that sleep would take me soon. I allowed myself a moment to think about the inn's reputation before pushing the thought away as wishful thinking. Before I quite knew it, I found myself drifting off. The sinister laughter drew me like a beacon, and I knew that I had to capture it before it killed again. Children, like Christian, like my boys, like the little girl upstairs trying to cope with her father's death, were its staple victims. Its. The thing looked like a ten-year-old boy, but the eyes were dark, soulless. It was the abyss that looked back. "Scully, down here!" Mulder yelled, and I wanted to call back that he was going in the wrong direction. But if I did, the thing would hear me and change its course, so I let him blunder down the wrong corridor while I forged ahead. Suddenly a man stepped out of a room, and I nearly squeezed past him before it even registered that someone else was there. It was my neighbor. "Daniel?" "It's not a person," he told me grimly. "I know," I acknowledged, and he let me by. Daniel didn't move, but when I turned back several seconds later, he was gone. After a few minutes more, I felt like I'd gone deaf. I could no longer hear Mulder, or the chilling laughter that I'd been following. If my flashlight had chosen that moment to go out, I would have been plunged into complete sensory deprivation. I was still straining to hear something, anything, when I felt the familiar burn of small scaly fingers clamping down on my wrist. Without a sound it had managed to get behind me. The fingers crushed, making my drop the flashlight. When I woke up, I was filled with a sense of despair, and not because I'd just woken from my reoccurring nightmare. The dream made me suspect that I was having a harder time letting go of the X-Files forever than I thought I would upon agreeing with Mulder that we were through with them back after helping the FBI nearly two years earlier. Somehow, Mulder seemed more content with closing the book on it, at least if my dream was any indication. But it wasn't the nightmare that had me the most upset when I sat up in bed and looked around the room that morning. 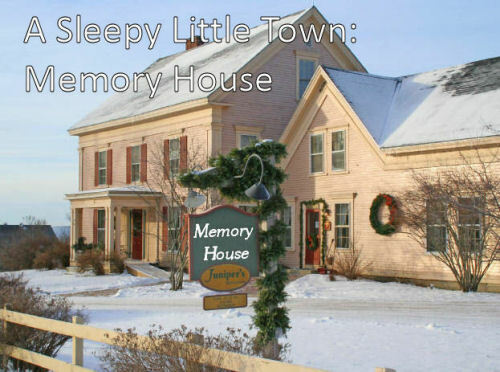 I hadn't truly expected there to be anything to the legend of Memory House, but a tiny part of me had hoped, more than I realized, that I'd dream about Emily. It would have been nice to see her once more, even if only in a dream. Was it normal to still miss someone I'd known for a short time? I didn't know, but I couldn't deny that I did. Whenever I saw a blonde girl who was the age she would have been if she lived, I felt a tightness in my chest for just a second, just when I had to tell myself that it couldn't be her. I was still wallowing in self-pity when there was a knock on the door. Fortunately, I'd managed to get dressed before it came. "Hey, Max," I said, probably sounding as listless as I felt. "Good morning. Did you dream about your daughter?" Max asked, getting down to business right away. I had the feeling that he'd already been awake for hours. Max nodded. "Do you remember what you dreamed about?" "Not Emily," I said sharply. He just looked at me. "You really care what I dreamed about?" "I'm all in," he said, sounding only slightly less sharp than I had. "If I'm going to sell this dream analysis story, I need to have the proper props." Waving a hand I asked, "Couldn't you just make something up?" "What if your friend asks you what you told me?" I guess he had a point. "All right. Last night I dreamed the same thing I have twice before in the past few weeks: my husband an I are running down the corridors of a deserted hospital, chasing after a-" I hesitated, not wanting to use the "d" word with someone unfamiliar with the sorts of cases Mulder and I had really been on. "-after a child who had committed murder. Before I wake up, I feel the boy's fingers on my wrist, and I know it's too late. I'm going to be victim 13." Max's eyes were wide, and he gulped audibly. "You really were an FBI agent once, weren't you?" It took a lot not to groan. I was quickly realizing that anything said to Judith would become common news. "We were, yes." "Is...is this dream about one of your real cases? A killer kid?" "Still, it sounds like a pretty awful dream," Max remarked. "That's a pretty accurate guess." I shook my head. "I just wish I could shake it." Max gave me a sympathetic look. "You're in medicine now, so at least you know it's not a premonition of some sort." "Oh no, not you," I groaned. "You're going to be so happy when you get to asking Monica about her dream." "I'm on my way now." Max walked back to the door. "I hope this is the last time you have that dream." "Thanks again for your help. I'll give you a call the day before the article runs." An hour or so later, we made our way down to the inn's small dining room, and had the place practically to ourselves. Vickie must have noticed our surprise because as she brought a pot of coffee to our table she said, "Everyone else got an early start. They're hitting the ski slopes over at Gunstock, and it's an hour's drive from here." "Skiing?" Monica asked. "But there's hardly any snow." Vickie rapped her knuckles against our table. "They make a lot of the snow, hon, since they never can tell how much snow there's going to be in a given season, or when it'll fall. Sometimes we'll get four feet in December, sometimes nothing until MLK Day. Things have been a lot more predictable for them since they invented those snow making machines." "So, can I bring you waffles or pancakes?" We all ordered the waffles. While we waited for them, I turned to John and Monica. "I trust that Max was nice to you this morning?" "Sure, he's a nice kid," John told me. Kid. He sounded like Mulder. "What did you dream about?" To my shock, they both shook their heads. "Sorry, we promised not to tell you or each even other." "Oh." What was Max's motivation, I wondered. "That's okay." "He said it wouldn't be so long before the story came out anyway," John added. "True enough." After that, I changed the subject, unwilling to let Max waste any more of my time. I wished him well with impressing his chief enough to get the story published, but if he swore them to secrecy for some bizarre reason, I wasn't going to obsess about the contents of the article. As far as I was concerned, I was through with it. Monica gave me a hug, which I returned happily. "It was so nice of you to invite us up here." "I'm glad you had a good time." I really was. Since they seemed to have had a nice time, I no longer felt guilty for having brought them up under semi-false pretenses. Only semi-false because I really had wanted them to come up and meet the baby and see the house too. She turned to where Mulder was holding the baby. "Bye bye, sweetie." "See ya, dollface," Mulder deadpanned. Monica smirked at him, and John looked over to me for rescue: Joey and William were being very demanding of his attention now that they knew he was leaving. "Hey guys? Dad and I want to say goodbye to John too." They looked crestfallen for a second, but quickly recovered. "You're gonna come back, right?" William demanded to know. "If your parents can stand having us around," John said solemnly, and they looked horrified until they realized that he was joking. There was another round of goodbyes, and I walked them out to their car. After Monica promised to drive carefully, they backed out of the driveway and hit the road. I was still standing there watching them wave when Mulder came up behind me. I leaned back against him as he smoothed my hair back. "Goodbyes never get easier, do they?" "I don't know," I said, "This is easier than when we broke you out of jail. Then we didn't know if we'd ever see them again." "That's true. Come on, it's starting to snow again." As we walked back to the house the door opened and both boys ran out with their sleds. "Okay, right?" Joey asked, looking excited about the falling snow. Mulder tapped his watch. "Thirty minutes then you come in for us to see if you're warm enough to safely go back out." "Deal!" they both cried, racing each other to the backyard. Being apart from friends was hard, but there were definite advantages to living up here, too. The rack to the oven rattled as I shoved it back in. It was nice to see the pie sitting there, patiently waiting to become the dessert that Joey had worked so hard on under my supervision. "So in forty-five minutes it'll be done?" Joey asked. The apron I'd tied around his waist was covered in floury finger prints and the hem dangled down to his shins. He looked adorable. "It'll be done cooking, but we'll have to cool it first," I cautioned. "I know." He studied the temperature dial on the front of the oven. "It doesn't go to 700, huh?" When I said, "Doubling the temperature wouldn't cook it faster, Joey. It'd just burn it up," he looked at me like he thought I'd just read his mind. I laughed, I couldn't help it. I picked up the cup of cherry pits off the counter and handed it to him. "Could you throw these in with the compost, please?" "Oh." He looked disappointed. "We can't try to grow a cherry tree?" I knew the odds of actually growing anything viable were poor, but I scooped a few of the pits out anyway. "We can't try to grow an orchard, but we'll see what happens with these if we dry them this winter." To my delight, he broke into a huge grin. "We'll have so many cherries we'll have to make pie all the time," he exclaimed as he opened the door. "Mom, phone," William said, bringing it to me. "It's Max Kirby. I just wanted to let you know that the article comes out tomorrow. Someone should be by with a copy first thing in the morning." I almost told him that it was unnecessary and that no one had to go to the trouble, but that seemed dismissive. "Thank you." "No, thank you. I hope you like the article." Joey came back in, and I had to stop him from pressing his nose up against the glass window of the open. It was nice that the article was being published, but I had bigger things to think about, like keeping Joey and the pie apart until it was done. The kitchen was chaos. William had tried to pour himself a bowl of cereal, but had failed to notice that the bag had split down the seam, so he ended up with a third of the box on the table. Then, trying to help him clean it up, Joey had knocked over the milk. He'd simply stared at the milk cascading onto the floor for a moment before William put his hand on his shoulder. "Don't cry, Joey." Joey shook his hand off and gave him a dirty look. "I'm not crying." "Well good, because you're not supposed cry over spilled milk." I ignored them. Leaving the cereal all over the place so I could get to Autumn's well-baby appointment on time had been a possibility, but there was no way that half a gallon of milk could wait around all morning. Glancing at the clock, I said, "You two, go. I don't have time to drive you to school if you miss the bus." They darted towards the door and grabbed their backpacks and coats before leaving. At least they weren't helping any more, so maybe I had a fighting chance. The dirt devil roared to life as I started by getting the cereal off the table. It seemed like if I didn't, the cereal was more likely to join the milk on the floor when it came time to mop. "What the...?" a voice behind me asked. "Don't even ask," I commanded. When I turned around I saw Mulder standing behind me with Autumn in his arms. He gave the mess a hard look, then reached for Autumn's baby bag. "Second floor of the Miller building, right?" Casting him a grateful smile, I agreed. "First door on the left." "Okay. Good luck with," he waved his free hand at the mess, "all this." "No problem, I hit a bit of writer's block this morning, anyway," he explained, referring to the book I was surprised he'd already begun drafting. I wouldn't admit it under the pain of death, but I'd been sure that he wouldn't have gotten around to starting until long after I began my new job. "Maybe you'll be inspired while you're out," I suggested. He snorted. "Well, Autumn's beautiful, but there are babies who make you think of aliens, so maybe I will." In the end it took me twenty minutes to get everything cleaned up, and to add a box of cereal and more milk to the grocery list. Only then, when I heard a strange car in the driveway, did I remember Max's promise to have a copy of the paper delivered. A clear plastic bag containing three copies of the paper had been neatly placed by the door. I brought it inside before opening it, mostly because a light snow had begun to fall. I unfolded the paper and was slightly disappointed to see that the story was not on the front page, but probably not half as disappointed as Max. Flipping through the pages, I found Max's byline on the top of page five, so I sat down and began to read through the article. A few minutes later I put the paper aside, and felt tears begin to prick at the corners of my eyes. I had fully expected the guest who had gone to Memory House for the express purpose of seeing her child to describe a wonderful experience with her dead daughter. That guest had gotten exactly what she'd paid for, and I was happy for her. If she'd had a nightmare like mine, I'm sure she would have been crushed. But what I hadn't expected was for John to describe his wonderful dream, a reunion with Luke. The thing that struck me the most was that he talked about dream in almost the same words as the other guest, and he hadn't even known about the inn's reputation. They'd both gotten to see their children again. Why not me? Did I just not believe hard enough? Had my skepticism robbed me of the same joy that they'd both experienced? It wasn't fair. But still, I dutifully filled out John's address on a padded envelope, added stamps, and put it in the mailbox, red flag raised. Having the mail carrier take it off with him was much easier than going to the post office, but it still wasn't easy. By the time Mulder got home, I'd put the paper away. I wasn't sure what I was going to say to him about it, or how I could possibly explain how disappointed I was when I'd claimed not to even remotely believe that seeing Emily was possible. I ran into Russell Carr a few days later, while bringing William and Joey to Staples to buy poster board for a class project. He smiled broadly when he spotted me. "You're Judith's friend Dana, right?" "I saw that Max roped you into that article after all. Sorry about that. I feel sort of responsible." I felt that way too, but I tried to be polite about it. "It's okay." "Can I offer you a flyer?" He held out one from the stack he'd just taken from someone behind the copy counter. "I promised Hattie that I'd try to lure people to the founder's day event by handing out flyers to the people who visit the museum." Russell offered me a self-deprecating smile. "She's not expecting me to send her a lot of traffic, but I try." "She seems very sharp to me," I told him. "The historical society is lucky to have her." "Sure are," he agreed. Then he gave me a look I couldn't read. "If you talk to her, you should ask her about the town name." "The town name?" I repeated. "Yup," he agreed. The clerk handed him his bill, and he turned away to pay for it, so I assumed the conversation was closed. "This is what we need," Joey said, walking quickly towards me. William trailed behind him, eyes on something else. I thought maybe it was the cover of a notebook. By the time I got them squared away, Russell had left, so I never did find out what he meant. On a whim, I pulled into the parking lot of the historical society. I'd promised to visit and it seemed like a good time to since there was just one car in the lot. Getting Autumn into her sling took a moment, but I didn't rush it because she was sound asleep and I wanted her to stay that way. A bell chimed when I opened the door, and I cringed and waited, but Autumn didn't stir. "Dana!" a voice said in welcome. I wasn't surprised to see Hattie Copeland looking to me. "Hello, Ms. Copeland," I said, walking over to where she was sitting. She nodded approvingly. "I'd like to meet your mother." "My mother?" I repeated, confused. "These days so many young people lack manners, and are overly familiar. Some of them call me Hattie like we're old friends without even asking to." "Oh, I wouldn't call myself young�" These days, despite having a baby, I felt the pull of middle age. She chuckled. "I'm nearly twice your age. That's young to me." "Duly noted." It was hard not to smile. "So, I take it that you're here because you want to know more about this little town you've found yourself in," Hattie said, suddenly all business. "Pretty much. Russell Carr told me that you could tell me about the town's name," I said, remembering the conversation. I thought I saw her stiffen, but it was so brief, I concluded that I'd imagined it. "The town name came up?" "I did a little research," I told her. "Bally means 'home' or 'homestead,' and 'guest' is self-explanatory. So, guest home, that's sort of nice. A bit cloying, but nice." She gave me the oddest look. "What?" "It didn't used to be Ballyguest." "No? Then what was it originally?" My brow furrowed in confusion. "Ghaist? But that's-"
"A Scottish word for ghosts," Hattie said softly. "The town's first name meant 'Homestead of Ghosts.'" End Note: Which of Mulder and Scully's new acquaintances do you think will send things into a tailspin? Read the next story now to find out!